Provided is an HMD or the like that suppresses abnormalities in stereoscopic viewing and viewing-induced fatigue or visually-induced motion sickness even when worn misaligned with the head. The HMD is provided with: a display (80) that displays a three-dimensional image; a position acquisition unit (100) that measures the position of the inner corner or the outer corner of the eye of a viewer relative to the display (80); a standard position storage unit (50) that obtains and stores, as a standard position, a position of the inner corner or the outer corner of the eye which is measured through calibration for determining a standard position related to said position; a positional misalignment detection unit (60) that detects, in the form of a positional misalignment, the difference between the standard position and a position newly measured of the inner corner or the outer corner of the eye of the viewer relative to the display during the viewing of content; and an image processing unit (70) that applies image processing to the three-dimensional image displayed on the display (80) according to the detected positional misalignment such that the three-dimensional image is rotated or shifted parallel. 本发明涉及头戴式显示器，尤其涉及在头戴式显示器中显示三维影像的技术、以及调整其位置偏差的技术。  The present invention relates to a head-mounted display, particularly to a three-dimensional image display technology, and adjusting the position deviation of the head mounted display technology. 头部佩戴型影像显示装置即头戴式显示器(Head Mounted Display:下面也记述为“HMD”)，被用作人不能直接操作的危险区域的作业用或遥远地区作业用的远程操作系统的显示器，此外也被用作嵌入式游戏机等的显示器。  The head-mounted display apparatus that is a head mount display (Head Mounted Display: hereinafter also referred to as "HMD"), the remote operation of a working area as a working or remote operation can not be directly hazardous area display system, in addition, be used as a game machine or the like embedded display. 关于嵌入式显示器，曾提出了覆盖眼睛周围并固定于头部的护目镜式的显示器，另外随着设备的小型轻量化，还提出了便携式的影像内容欣赏用途的更加轻量的眼镜式的显示器。 About embedded display has been proposed a goggle type display cover fixed to the head and around the eyes, the other with the size and weight of the apparatus, is also proposed the use of portable video content to enjoy a more lightweight eyeglass-type display . 另一方面，三维影像不仅在电影中得到普及，而且随着家庭用的三维电视机或计算机显示器的普及，也被广泛用作电视内容或游戏机的影像。  On the other hand, three-dimensional images gained popularity not only in the film, and with the popularity of three-dimensional television with the family or a computer monitor, is also widely used as a video game console or TV content. 三维影像是通过在提示给右眼的图像和提示给左眼的图像之间形成视差，使视听者产生好像存在进深的错觉的影像。 Three-dimensional image is formed by parallax images presented to the right eye and the left eye image between the tips, so that if there were to generate an image viewer the illusion of depth. HMD使显示器保持与视听者的眼睛极近，使容易对左右眼睛提示不同的图像。 HMD display remains with the viewer's eyes very close, so easy on the left and right eye images of different tips. 因此，适合于视听二维影像。 Therefore, the two-dimensional image suitable for viewing. 但是，HMD由于被固定于视听者的头部，因而在视听者将头部倾斜的情况下，画面也随着头部一起倾斜，导致画面的垂直轴与实际视听空间中的垂直轴的偏差。  However, because of the HMD is fixed to the head of the viewer, and thus in the case where the viewer's head tilt, the screen together with the tilting of the head, leading to a vertical axis perpendicular to the axis of the screen and the actual viewing space bias. 因此，利用前庭器官来感知重力加速度的人有时因为实际空间的垂直轴与画面的垂直轴的偏差而眩晕。 Thus, the use of the vestibular organ for sensing the acceleration of gravity offset because sometimes the vertical axis and the vertical axis of the real space pictures and vertigo. 与此相对，过去有这样的技术:如专利文献I所述，利用传感器检测头部的倾斜，并以校正该倾斜的方式使矩形的显示区域旋转进行显示，由此即使是头部倾斜时也能够使视听者识别为所显示的图像的朝向被固定于水平方向。 On the other hand, in the past, a technology: The Patent Document I, using the tilt sensor detects the head, and to correct a manner that the inclined rectangular display region to display the rotation, whereby even when the head is tilted too enables the viewer to recognize the displayed toward the image is fixed to the horizontal direction. 近年来HMD也被小型轻量化，非大型护目镜式、轻便眼镜式的方案增加。  In recent years, lightweight HMD can be miniaturized, a large non goggle, glasses type portable program increases. 与完全看不到周围的实际环境的嵌入式的进行视听的护目镜类型不同，在采用透明透镜或较小的透镜直径的眼镜式HMD中，视听者不仅观察HMD显示器上的图像，而且也观察周围实际环境。 Goggle type totally embedded in the actual environment surrounding not be viewed is different in the transparent lens or spectacle lens diameter smaller type HMD, the viewer not only to observe a display image on the HMD, but also observed around the actual environment. 这种类型适合于便携式的影像内容欣赏用途。 This type of video content suitable for portable use appreciation. 假设在交通工具中移动着使用或步行着使用的用途。 Suppose moving on foot or used the purpose of use in a vehicle. 这样当在头部移动或者振动的状态下使用轻量的眼镜式HMD时，HMD与头部的位置关系有可能偏差。 So that when the lightweight eyeglass-type HMD movement or vibration at the head of a state, the positional relationship between the head and the HMD possible deviations. 针对根据HMD的安装状态而视听者的眼睛位置与画面位置之间产生偏差的问题，在专利文献2中记述了根据视听者的视野来校正水平方向和垂直方向的偏差的技术，在专利文献3中记述了根据虹膜或者瞳孔的图像求出眼球的位置来校正水平方向和垂直方向的偏差的技术。  The problem of bias for the eye position of an HMD according to the mounted state between the screen and the viewer's position, according to the technique described deviation of the field of view of the viewer to correct the horizontal and vertical directions in Patent Document 2, in Patent Document 3 describes a technique to correct the deviation in the horizontal direction and the vertical direction from the position of the iris image or the pupil of the eye is obtained. 专利文献2:日本特开2010 - 232718号公报  Patent Document 2: JP 2010 - 232718 Patent Publication No. 但是，在专利文献2和专利文献3的技术中，在HMD被安装成偏离头部的状态的情况下，存在引发立体视的异常、视听时的疲劳或者影像眩晕的问题。 In the case  However, in Patent Documents 3 and PTL 2, is mounted in a state offset from the head of the HMD, a perspective view of the abnormal presence of an initiator, the problem of fatigue or dizziness when viewing the image. 为了达到上述目的，本发明的一个方式的头戴式显示器具有:显示器，显示三维影像；位置取得部，测量视听者的内眼角或者外眼角相对于所述显示器的位置；标准位置存储部，将用于决定与所述位置相关的标准位置的校准中由所述位置取得部测量出的所述内眼角或者所述外眼角的位置，作为所述标准位置取得并存储；位置偏差检测部，检测由所述位置取得部新测量出的正在视听内容的所述视听者的所述内眼角或者所述外眼角相对于所述显示器的位置、与在所述标准位置存储部中存储的所述视听者的所述标准位置之差，作为位置偏差；以及图像处理部，在由所述位置偏差检测部检测出位置偏差时，以使显示于所述显示器的三维影像根据所述检测出的位置偏差而旋转或者平行移动的方式，对所述三维影像进行图像处理。  To achieve the above object, a head-mounted display of the embodiment of the present invention includes: a display to display three-dimensional video; position acquisition unit, an outer or inner corner of the eye measured viewer position relative to the display; standard position storage section, for calibrating the position related to the standard position determined in the position acquired by the position of the measured portion or the inner corner of the outer corner of the eye, as a standard and stores the position acquired; positional deviation detecting unit, acquires the detection portion of the viewer viewing new content is being measured or inner corner of the outer corner by the position relative to the position of the display, and stored in the storage unit in the standard position the difference between the normal position of the viewer, as the position deviation; and an image processing unit, when the position deviation detected by said positional deviation detecting section, so that the display on the display based on the detected three-dimensional image positional deviation or parallel movement and rotational manner, the three-dimensional video image processing. 另外，本发明不仅能够实现为具有这种结构的头戴式显示器，而且也能够实现为将头戴式显示器具有的处理部包含为步骤、并调整(或者补偿)显示于头戴式显示器的三维影像的位置偏差的方法，也能够实现为使计算机执行该调整方法的程序，还能够实现为记录了该程序的计算机可读的非暂时性的CD — ROM等记录介质。  Further, the present invention not only can be implemented as a head-mounted display having such a structure, but can be implemented to have a head-mounted display comprising a step of processing unit, and adjust (or compensate) the head mounted display in the method of three-dimensional image display of the position deviation can be implemented to enable a computer to execute the adjustment method, it is also possible to record the computer program readable non-transitory CD - ROM recording medium. 根据本发明的头戴式显示器(HMD)，能够舒适地视听三维影像，而且不受HMD的佩戴位置偏差的影响。  The head-mounted display (HMD) of the present invention, three-dimensional image can be viewed comfortably, and is not affected by the positional deviation of the HMD wearer. 因此，根据本发明提供的头戴式显示器，即使是被安装成偏离头部的状态时，也能够抑制其视听者产生立体视的异常、视听时的疲劳或者影像眩晕，因而在三维影像得到普及的今天，本发明的实用价值极高。  Thus, according to the present invention provides a head-mounted display, is mounted to the state even if the head deviates, it is possible to suppress the generated stereoscopic viewer abnormality, fatigue or dizziness when viewing the image, so three-dimensional video gained popularity today, a very high practical value of the invention. 图1是说明头戴式显示器的佩戴位置的偏差与三维影像的观察方式的示意图。  FIG. 1 is a schematic view of the embodiment of the three-dimensional image and the deviation of the position of the head-mounted display worn FIG. 图2是示意地表示视听者的眼睛相对于在视听者的头部倾斜时产生的头的纵向偏差而移动的方向的图。  FIG. 2 is a schematic showing the head relative to the longitudinal deviation generated when the head of the viewer is inclined in the direction of movement of the viewer's eye relative. 图3是利用视线检测装置记录了在正立视听向右旋转10度而显示的立体图像时的左右眼球的视点的图。  FIG. 3 is a view of FIG recording time left eye stereoscopic image is rotated 10 degrees in an upright displayed by viewing the right visual line detection means. 图4是表示图3中的视线检测装置的概要图和在视线检测中使用的眼睛的影像的示例的图。  FIG. 4 is a diagram showing an example of a schematic diagram and image of the visual line detection device of FIG. 3 used in the line of sight of the eye detection. 图5是表示本发明的实施方式I的头戴式显示器的整体结构的一例的块图。  FIG. 5 shows the first embodiment of the present invention is a block diagram showing an example of the I whole configuration of a head-mounted display. 图6是表不内眼角和眼球和瞳孔的位置的图。  FIG. 6 is a table showing the position of the eyes and the eye and without pupil. 图7是表示该头戴式显示器具有的图像处理部的具体结构的一例的块图。  FIG. 7 is a block diagram showing an example of a specific configuration of the head mounted display having an image processing unit. 图8是表示在利用软件实现本实施方式I的头戴式显示器的处理部时使用的硬件结构的块图。  FIG. 8 is a block diagram of a hardware configuration used in the processing unit is implemented using software embodiment I of the present embodiment of the head-mounted display. 图9是表示本发明的实施方式I的头戴式显示器的动作的一例的流程图。  FIG. 9 is a flowchart showing the operation of Embodiment I of the present invention the head-mounted display. 图10是详细表示图9中的校准步骤(S120)的处理流程的一例的流程图。  FIG. 10 is a flowchart showing a process flow of the calibration step in FIG 9 (S120) in detail. 图11是表示内眼角形状的模型的信息的一例的图。  FIG. 11 shows an example of the information model the shape of the inner corner. 图12是表示左右的摄像机的摄像范围的图。  FIG. 12 is a diagram showing the imaging range of the camera of the left and right in FIG. 图13是表示在标准位置存储部中存储的数据的示例的图。  FIG. 13 is a diagram showing an example of the standard position storage unit stores the data. 图14是详细表示图9中的位置偏差计算步骤(S150)的处理流程的一例的流程图。  FIG. 14 is a flowchart illustrating an example of positional deviation calculation step 9 in FIG. (S150) the processing flow of FIG. 图15是详细表示图9中的校正处理步骤(S170)的处理流程的一例的流程图。  FIG. 15 is a flowchart showing a process flow of correcting process steps in FIG 9 (S170) in detail. 图16是表示本发明的实施方式I的头戴式显示器的佩戴位置的偏差的读出(sensing)状态的示意图、和用于说明以坐标平面状来计算佩戴位置的偏差的方法的一例的图。  FIG. 16 is a schematic diagram (Sensing) of the read state deviation wearing position according to Embodiment I of the present invention, the head-mounted display, and a method for describing a planar coordinate calculating a deviation of the wearing position example of FIG. 图17是表示在标准位置蓄积部中蓄积的数据的示例的图。  FIG 17 is a diagram showing an example of the standard position accumulated in the data accumulation unit. 图18是详细表示本发明的实施方式I的微调(S220)的处理流程的一例的流程图。  FIG. 18 is a flowchart showing an exemplary embodiment of the present invention, I trim (S220) the processing flow of FIG. 图19是表示内眼角标准位置的周围区域的一例的图。  FIG. 19 shows an example of the area around the inner corner of the standard position. 图20是详细表示图9中的校正处理步骤(S170)的处理流程的另一例的流程图。  FIG. 20 is a flowchart showing another example of the process flow of correcting process steps in FIG 9 (S170) in detail. [0041 ] 图21是详细表示图9中的校正处理步骤(S170 )的处理流程的又另一例的流程图。  FIG. 21 is a flowchart showing still another example of a process flow of correcting process steps in FIG 9 (S170) in detail. 图22是表示本发明的实施方式2的头戴式显示器的硬件结构的一例的图。  FIG. 22 is a diagram illustrating an example of a hardware configuration of the head mounted display of the embodiment 2 of the present invention. 图23是表示该头戴式显示器的安装状态的各种示例的图。  FIG. 23 is a view showing various examples of the mounted state of the head-mounted display. 图24是说明在本发明的实施方式2中计算头戴式显示器倾斜的角度的方法的图。  FIG. 24 is a diagram showing a method of calculating the angle of inclination of the head mounted display in Embodiment 2 of the present invention. 关于在“背景技术”部分中记述的专利文献2和专利文献3的技术，本发明者发现存在以下问题。  For described in the "Background" section of Patent Document 3 and Patent Document 2 technologies, the present inventors have found the following problems. 在专利文献2和专利文献3的技术中，根据视野或眼球位置即视听者的眼睛的移动来进行图像的位置校正，因而在视听者将视线移动到画面的端部时，有时图像进行不必要的移动。 When  Patent Document and PTL 3 2 in accordance with the movement of the eye visual field or eyeball position i.e. the viewer to position correction of the image, and thus the viewer will move the line of sight to the end portion of the screen, sometimes the image unnecessary movement. 并且，只能根据视野或眼球位置捕捉水平和垂直的眼球的移动，不能检测视听者的头部的水平垂直轴与画面的水平垂直轴偏差的状态。 And, only capture eye movements in accordance with the horizontal and vertical field of view or eye position, the vertical axis can not be detected horizontal head-state level of the viewer and the screen vertical axis deviation. 图1是表示利用HMD视听三维影像时的左右眼睛与图像的关系的图。 Showing the relationship between the left and right eye images  FIG. 1 is a diagram showing a three-dimensional image when viewing HMD. 左栏(“正常时”)表示HMD和头部的位置正常的情况的示例，右栏(“佩戴位置偏差时”)表示HMD偏离头部的情况的示例(“显示器与眼睛的位置关系”、“观察方式”)。 Example HMD left column and the head position of the normal situation ( "normal"), the right column shows an example ( "the positional relationship between the display and the eye" HMD deviations of the head ( "positional deviation when worn"), "observation mode"). 在图1所示的右栏的示例中，表示HMD的右侧相对于右眼的位置降低、而且左侧相对于左眼的位置上升的状态。 In the example shown in the right column in FIG. 1, a right side of the HMD with respect to the right-eye reduction, and left with respect to the left-rising state. 如前面所述，三维影像在提示给右眼的图像和提示给左眼的图像之间形成水平方向的视差，需要使该视差与连接两眼的直线平行。 As previously described, three-dimensional image is formed in the horizontal direction a parallax between the image presented to the right eye and the image presented to the left eye, the parallax needs to be straight and parallel connection of two. 在HMD的右眼用和左眼用的显示器被配置成与连接视听者的右眼和左眼的直线平行的情况下、即图1的左栏所示的“正常时”，三维影像的右眼用图像和左眼用图像的视差被准确配置成与连接两眼的直线平行。 The case of the straight line is arranged right and left eyes of the viewer is connected in parallel with the right and left eyes of the HMD displays "normal" in the left column of FIG. 1 that is shown in the right, the three-dimensional image eye parallax image is accurately disposed in parallel with the straight line connecting the two left-eye and the image. 可是，在HMD与视听者头部的位置关系偏差的情况下、即图1的右栏所示的“佩戴位置偏差时”，HMD偏离头部，由此左侧的画面被提示到更上方，右侧的画面被提示到更下方。 However, in the case where the positional relationship between the HMD and the viewer's head deviation, i.e., the right column shown in FIG. 1 "when worn positional deviation", departing from the head HMD, thus prompted to the left of the screen is more upward, the right side of the screen to be prompted more below. 在左右的画面中本来上下位置相同并存在水平方向的视差的图像，由于HMD的倾斜，而成为不仅水平方向而且垂直方向也与视听者具有偏差的左右图像。 Originally present in the horizontal direction and the same in the vertical position of the screen left and right parallax images, due to the inclination of the HMD, and become not only a horizontal direction but also the vertical direction and the left and right images deviation viewer. 虽然右眼用、左眼用的各画面的水平轴的倾斜能够根据前述的专利文献I的技术通过使图像旋转而消除，但是左右画面的上下位置的偏差不能利用专利文献I的技术而消除。 Although the right eye, the horizontal tilt axis for the left eye of each frame can be eliminated by rotating the image according to the technique of Patent Document I, but the deviation of the vertical position of left and right frames can not be eliminated using the techniques of Patent Document I. 人的眼球本来在观察近处时两眼靠拢(聚焦)，在观察远处时两眼散开(散焦)。 Originally, the human eye when viewed in two close vicinity (focus), when viewed two spread distance (defocus). 对于水平方向的视差，左右眼睛向彼此相反的方向移动是自然的动作。 Parallax in the horizontal direction, the left and right eyes move in opposite directions to each other is a natural movement. 可是，当在实际世界中观察对象物时，左右眼睛不会沿垂直方向上向相反方向移动。 However, when the object to be observed in the real world, the left and right eyes do not move in the opposite direction in the vertical direction. 三维影像中的垂直方向的偏差是使想要观察对象物的左右眼睛沿垂直方向进行相反方向的移动。 Variation in three-dimensional image in the vertical direction is desired to make the left and right eye observation object moves in the opposite direction in the vertical direction. 因此，三维影像中的垂直方向的偏差成为立体视的异常、视听时的疲劳或者影像眩晕的原因。 Thus, variation in the three-dimensional image in the vertical direction of the stereoscopic viewing becomes abnormal due to fatigue or dizziness when viewing the image. 即存在如下问题，在HMD被安装成偏离头部的状态的情况下，即使是实施专利文献I〜3中记述的任意一种校正，也会引发立体视的异常、视听时的疲劳或者影像眩晕。 That is, when there is a problem, is mounted in a state offset from the head of the HMD, even if any embodiments described in the Patent Document I~3 correcting, will lead to abnormality in stereoscopic viewing, fatigue or dizziness when viewing the image . 因此，本申请发明者们提出了这样的头戴式显示器等，即使是被安装成偏离头部的状态时，也能够抑制其视听者产生立体视的异常、视听时的疲劳或者影像眩晕。  Accordingly, the present inventors have proposed a head-mounted display and the like, even in a state when being mounted offset from the head, it is possible to suppress the generated stereoscopic viewer abnormal fatigue when viewing the image or dizziness. S卩，本发明的一个方式的头戴式显示器具有:显示器，显示三维影像；位置取得部，测量视听者的内眼角或者外眼角相对于所述显示器的位置；标准位置存储部，将用于决定与所述位置相关的标准位置的校准中由所述位置取得部测量出的所述内眼角或者所述外眼角的位置，作为所述标准位置取得并存储；位置偏差检测部，检测由所述位置取得部新测量出的正在视听内容的所述视听者的所述内眼角或者所述外眼角相对于所述显示器的位置、与在所述标准位置存储部中存储的所述视听者的所述标准位置之差，作为位置偏差；以及图像处理部，在由所述位置偏差检测部检测出位置偏差时，以使显示于所述显示器的三维影像根据所述检测出的位置偏差而旋转或者平行移动的方式，对所述三维影像进行图像处理。  S Jie, a head-mounted display of the embodiment of the present invention includes: a display to display three-dimensional video; position acquisition unit, measuring the inner corner or outer corner position of the viewer with respect to the display; standard position storage unit, the calibration determines a position associated with the standard position of the position acquired by the position of the measured portion of the outer or inner corner of the eye, acquires and stores, as the standard position; positional deviation detecting section, acquired by detecting the position of the new portion of the viewer viewing the content being measured in the outer corner of the corner or the relative position of the display, and stored in the storage unit in the standard position the difference between the standard position of the viewer, as the position deviation; and an image processing unit, when the position deviation detected by said positional deviation detecting section, so that the display position of the three-dimensional image on the display according to the detected deviation rotating or moving in parallel manner, the three-dimensional video image processing. 由此，即使是视线移动时，也能够与视线无关地根据不移动的内眼角或者外眼角与显示器的相对位置来校正眼睛与显示器的相对位置的偏差，因而在头戴式显示器的佩戴位置偏差的情况下，也能够防止由于眼睛与显示器的相对位置的偏差而造成的立体视的异常或疲劳和影像眩晕。  Accordingly, even when the eye movement, it is possible in accordance with the line of sight does not move irrespective of the relative position of the inner corner and the outer corner of the display or to correct the deviation of the relative position of the eye of the display, and thus the head-mounted display wearing the case where the positional deviation, it is possible to prevent abnormal or fatigue and dizziness stereoscopic image due to deviation of the relative position of the eye of the display caused. 其中优选，所述位置取得部具有测量所述视听者的瞳孔与所述显示器的相对位置的传感器，所述头戴式显示器还具有校准部，该校准部根据由所述传感器测量的在所述显示器不显示所述三维影像的状态下的所述相对位置，决定所述标准位置，并将所决定的标准位置存储在所述标准位置存储部中。  Preferably wherein said position acquiring unit includes a sensor measuring the pupil of the viewer and the relative position of the display, the head-mounted display further includes a calibration portion, the calibration unit based on the measurement by the sensor the relative position of the state in which the three-dimensional image is not displayed on the display, determining the standard position, the standard position and stores the determined position of said standard in the storage unit. 因此，能够使与视听者观察无限远处时相同的瞳孔位置和图像的中心一致，能够根据视听者的眼轴的偏差设定图像的显示位置，能够减轻视听者视听影像时的疲劳。 Therefore, the center of the pupil position and the same image is viewed at infinity and is consistent viewer, the image display position can be set according to the deviation of the axial length of the viewer, can reduce fatigue of the viewer viewing the image. 另外，也可以是，所述图像处理部进行使构成所述三维影像的左眼用和右眼用的图像分别旋转的处理、以及使所述左眼用和所述右眼用的图像沿水平方向和垂直方向移动的处理。  Further, it may be that the image processing section processes three-dimensional image constituting the left and right-eye images are respectively rotated, and the left-eye and the right eye moving image processing in the horizontal and vertical directions. 因此，能够对眼睛与显示器的相对位置的偏差进行补偿，消除两眼的垂直轴方向的差异，并显示在两眼的水平轴上具有影像形成时的两眼视差的图像。 Thus, possible deviation of the relative position of the eyes and the monitor compensation, to eliminate differences in the two vertical-axis direction, and displays an image having a binocular parallax image is formed when two of the horizontal axis. 因此，即使是头戴式显示器的佩戴位置偏差时，视听者也能够舒适地继续视听三维影像。 Thus, even if the positional deviation is wearing the head-mounted display, the viewer can continue to comfortably viewing three-dimensional video. 另外，也可以是，所述图像处理部还进行用于将构成所述三维影像的左眼用和右眼用的图像中的任意一方作为左右两眼用的图像显示于所述显示器的图像处理。  Further, it may be that the image processing unit further configured for either one of left-eye image and right-eye image of the three-dimensional image in a left and right eyes is displayed on the display image processing. 因此，在眼睛和显示器的相对位置偏差的情况下，通过将三维影像切换为二维影像进行显示，能够防止由于头戴式显示器的佩戴位置的偏差而造成的立体视的异常或疲劳、影像眩晕。 Thus, in a case where the relative positions of the eyes and the display of the deviation, by switching the three-dimensional video to two-dimensional image display, it is possible to prevent abnormal or fatigue due to the deviation of the stereoscopic head-mounted display worn position caused, motion sickness . 另外，也可以是，所述位置取得部对于所述视听者的左眼和右眼分别测量所述位置，所述标准位置存储部对于所述视听者的左眼和右眼分别存储所述标准位置，所述位置偏差检测部对于所述视听者的左眼和右眼分别检测所述位置偏差，所述图像处理部对于由所述位置偏差检测部检测出的所述视听者的左眼和右眼各自的所述位置偏差中、偏差量较小的眼睛用的图像，进行所述图像处理。  It is also possible that the position acquiring unit for respectively measuring the position of the viewer's left and right eyes, said standard position storage section with respect to the viewer's left and right eyes are stored the standard position, the positional deviation detecting section to the viewer's left and right eyes of the positional deviation detection, the image processing section to the viewer detected by said positional deviation detecting section the positional deviation of the respective left and right eyes, eyes with a small deviation of the image, performs the image processing. 因此，在头戴式显示器的佩戴位置偏差的情况下，能够减小在从三维图像切换为二维图像时的不协调感，使视听者连续观察使眼睛与显示器的相对位置处于更容易观察的相对位置的眼睛所对应的图像。 Thus, when the head-mounted display worn position deviation, a sense of incongruity can be reduced in three-dimensional image from two-dimensional image of the viewer eye continuously observed relative position of the display in a more easily viewable eye image corresponding to the relative position. 另外，也可以是，在由所述位置偏差检测部检测出的位置偏差的量超过预先设定的值的情况下，所述图像处理部进行用于将构成所述三维影像的左眼用和右眼用的图像中的任意一方作为左右两眼用的图像显示于所述显示器的图像处理，在由所述位置偏差检测部检测出的位置偏差的量未超过预先设定的值的情况下，所述图像处理部进行使所述左眼用和所述右眼用的图像分别旋转的处理、以及使所述左眼用和所述右眼用的图像沿水平方向和垂直方向移动的处理。  It is also possible that the amount of deviation detected by said positional deviation detecting section exceeds a position where a predetermined value, the image processing unit performs a left for constituting the three-dimensional video either eye image and right-eye images in the left and right eyes, as shown in the display image processing, the amount of deviation detected by the position deviation detection position does not exceed a preset value in the case where the image processing unit processes the left-eye image and the right eye so that the rotation, respectively, and the left-eye and the right eye image in the horizontal and vertical directions process moving. 因此，在头戴式显示器的佩戴位置的偏差较大时，从三维图像切换为二维图像，在佩戴位置的偏差较小时进行补偿偏差的图像处理，由此即使是产生头戴式显示器的安装偏差时，除了偏差过大时之外均能够欣赏三维影像，并且在安装的偏差过大时通过切换为二维影像，能够继续安全地视听影像。 Accordingly, when the deviation of the position of wearing the head-mounted display is large, the switching from the two-dimensional image three-dimensional image, image processing to compensate for variations in the wearing position deviation is small, whereby even when the installation is to produce a head-mounted display deviation, except when the deviation is too large outside are able to enjoy three-dimensional image, two-dimensional images by switching at the time of mounting deviation is too large, safe to continue viewing images. 另外，也可以是，所述图像处理部将由所述位置偏差检测部检测出的位置偏差分解为旋转和向水平方向及垂直方向的移动，在所述旋转的角度超过预先设定的值的情况下，进行将所述左眼用和所述右眼用的图像中的任意一方作为左右两眼用的图像显示于所述显示器的图像处理，在所述旋转的角度未超过预先设定的值的情况下，进行使所述左眼用和所述右眼用的图像分别旋转的处理、以及使所述左眼用和所述右眼用的图像沿水平方向和垂直方向移动的处理。  Further, it may be that the image processing unit by said positional deviation detecting section detects the positional deviation into rotational movement and in the horizontal direction and the vertical direction, the angle of rotation exceeds a preset when the value of, for either the left-eye image and the right eye in the left and right eyes as the image is displayed on the display image processing, the angle of the rotation does not exceed a preset at a given value, the processing for the left eye and right eye, respectively, the rotation of the image, and the left-eye and the image in the horizontal direction and the vertical direction of the right-eye movement deal with. 因此，在头戴式显示器的佩戴位置的偏差较大、并产生两眼的垂直偏差的情况下，从三维图像切换为二维图像，而在产生佩戴位置的偏差的两眼的垂直偏差较小的情况下，进行补偿偏差的图像处理，由此，在头戴式显示器的安装偏差中除对视听者产生负荷的偏差情况之外，均能够欣赏三维影像，并且在视听三维影像而对视听者产生较大负荷的情况下，通过切换为二维影像，能够继续安全地视听影像。 Thus the deviation in the position of wearing the head-mounted display is large, and a vertical offset of two, the three-dimensional image is switched to the two-dimensional image, thereby generating two small vertical deviations of position deviation wearing in the case where image processing is performed to compensate the deviation, whereby the misalignment of the head mounted display in addition to the load generated deviations of the viewer, are able to enjoy the three-dimensional image, and three-dimensional video viewing while the viewer a case where a greater load is, by switching to the two-dimensional image, it is possible to safely continue viewing images. 另外，也可以是，所述位置偏差检测部检测该头戴式显示器以所述视听者的鼻子为支点进行旋转而产生的位置偏差，作为所述位置偏差，而且，设该头戴式显示器的右侧降低的旋转是以所述视听者的鼻子右侧的凸面的一点为中心的旋转，设该头戴式显示器的左侧降低的旋转是以所述视听者的鼻子左侧的凸面的一点为中心的旋转，由此检测所述位置偏差。  It is also possible that the positional deviation detecting section detects the head mounted display to the viewer's nose as a fulcrum to generate a position deviation, a deviation of the position, and, provided the headset the right side of the display reduced rotational convex surface is centered on a point of rotation of the right side of the viewer's nose, the head-mounted display disposed on the left side of the left side is reduced rotation of the viewer's nose one o'clock as the center of rotation of the convex surface, thereby detecting the positional deviation. 因此，假设HMD的位置以预先得知位置关系的支点为中心而产生偏差，这样来检测位置偏差，因而能够按照更少的图像的特征量来检测HMD的位置偏差。 Thus, assuming that the HMD predetermined position relationship between the position of the fulcrum as a center bias, so that positional deviation is detected, it is possible in accordance with the image feature amount less to detect positional deviation of the HMD. 另外，也可以是，所述位置取得部具有拍摄所述内眼角的摄像机，作为所述位置偏差，所述位置偏差检测部使用从作为所述视听者的鼻子的凸面的一部分的支点到所述摄像机的位置的相对位置来计算该头戴式显示器的旋转量，由此检测所述位置偏差。  It is also possible that the position acquiring unit includes a camera photographing the inside corner as the positional deviation, the position deviation detecting unit using the fulcrum portion from a convex surface as the viewer's nose rotation amount of the relative position of the camera to calculate the head-mounted display, thereby detecting the positional deviation. 因此，由于使用从作为视听者的鼻子的凸面的一部分的支点到摄像机的位置的相对位置来计算HMD的旋转量作为位置偏差，因而能够更容易检测出HMD的位置偏差(倾斜)。 Thus, since the rotation amount is calculated using the HMD as the positional deviation, it is possible to more easily detect the position of the HMD deviation (inclination) from the convex part as a fulcrum of the viewer's nose to the opposite position of the camera. 另外，也可以是，所述位置偏差检测部使用与利用所述摄像机拍摄的图像的中心较近的所述内眼角或者所述外眼角的位置作为所述标准位置，来检测所述位置偏差。  Further, it may be that the position of the center of the image using the position deviation detecting portion captured using the camera or close the inner corner to the outer corner of the eye as the standard position, detecting the position deviation. 因此，由于使用与利用摄像机拍摄的图像的中心较近的内眼角或者外眼角的标准位置作为标准位置进行决定，因而能够高精度地检测出HMD的位置偏差。 Accordingly, since the standard position using the center of the image captured by the camera or close to the outer corner of the corner is determined as a standard position, it is possible to accurately detect the positional deviation of the HMD. 下面，使用附图来说明本发明的头戴式显示器及其位置偏差调整方法的实施方式。  The following describes the position of the head mounted display of the present invention and the embodiment of the method of adjusting the deviation using the drawings. 另外，下面说明的实施方式均用于示出本发明的优选的一个具体示例。 Further, the embodiments described below are one specific example illustrating the invention is preferably used. 在下面的实施方式中示出的数值、形状、材料、构成要素、构成要素的配置位置及连接方式、步骤、步骤的顺序等仅是一例，其主旨不是限定本发明。 In the following embodiments shown in numerical values, shapes, materials, structural elements, the arrangement and connection elements, steps, order of steps and the like are merely examples, and the gist of the present invention is not limiting. 本发明仅利用权利要求书进行限定。 The present invention is carried out only by the claims defined. 因此，关于下面的实施方式的构成要素中、没有在表示本发明的最上位概念的独立权利要求中记载的构成要素，不一定是实现本发明的课题所需要的构成要素，仅是作为构成更优选的方式的构成要素进行说明的。 Therefore, constituent elements in the following embodiments, there is no structural elements in the most generic concept of the independent claims of the present invention is described in not necessarily the constituent elements of the present invention to achieve the desired object, merely constituting more preferred components of the embodiment will be described. 下面，在详细说明本发明的实施方式之前，关于本发明对发明者们通过实验得到的见解进行说明。  Next, embodiments of the present invention prior to detailed description about the present invention will be described by the inventors of the findings obtained in the experiments. 本申请发明者们通过实验确认到在视听者倾斜头部进行立体视时，不可能进行实际空间中的眼睛的移动，而是进行左右相反方向的上下移动。  The present inventors have experimentally confirmed that the inclination of the head when the viewer a stereoscopic vision, eye movement is not possible in the real space, but is moved up and down right and left opposite directions. 在头部或者图像倾斜、连接视听者的两眼的线段与立体图像的水平轴即视差的方向存在偏差的情况下，视听者的眼睛向修正由于倾斜而产生的纵向偏差的方向移动。 The head or an image is inclined, when there is variation in the horizontal axis and the line segment connecting a stereoscopic image viewer, i.e., two parallax direction, the deviation direction of the longitudinal movement of the viewer's eye to the inclination correction generated. 即，由于倾斜而位于下方的眼睛向上方移动，由于倾斜而位于上方的眼睛向下方移动。 That is, the inclination located below the eye is moved upward, since the upward inclination of the eye moves downward. 图2是示意地表示视听者的眼睛相对于在视听者的头部倾斜时产生的头的纵向偏差而移动的方向的图。  FIG. 2 is a schematic showing the head relative to the longitudinal deviation generated when the head of the viewer is inclined in the direction of movement of the viewer's eye relative. 图3是利用视线检测装置记录了在正立视听向右旋转10度而显示的立体图像时的左右眼球的视点的图。 FIG 3 is a perspective view of left eye of the time of recording stereoscopic image rotation of 10 degrees in an upright displayed by viewing the right visual line detection means. 图4是表示该视线检测装置的概要图和在视线检测中使用的眼睛的影像的示例的图。 FIG 4 is a diagram showing an example of a schematic view of the image and the visual line detecting device for use in detecting the sight line of the eye. 如图4所示，视线检测装置是朝向眼球照射近红外线，通过图像处理求出在角膜表面的反射光和瞳孔中心位置，并利用它们的相对位置的关系来检测视线的装置。  4, the sight line detecting means is irradiated with near infrared rays toward the eye, the reflected light means the center position of the pupil surface of the cornea, and to use them relative positional relationship between the line of sight detected by the image processing is obtained. 在视线位置变化时，虽然反射光的位置不变，但是瞳孔中心位置变化。 When viewing position changes, although the position of the reflected light is unchanged, but the center of the pupil position changes. 在本实验中利用这两者的相对位置关系的变化独立地检测左右的视线。 Using the change in the relative positional relationship both in the experiment to detect the left and right eyes independently. 在图3中示出了:在图像没有倾斜、连接视听者的两眼的线段与立体图像的水平轴即视差的方向一致时，表示水平方向的视线移动的曲线图(图3 (a));表示垂直方向的视线移动的曲线图(图3 (b));以及在从视听者观察图像向右旋转10度、连接视听者的两眼的线段与立体图像的水平轴偏差10度的条件下，表示水平方向的视线移动的曲线图(图3 (c));表示垂直方向的视线移动的曲线图(图3 (d))。 In Figure 3 is shown: the image is not inclined in the direction of the connection line with the horizontal axis of the two stereoscopic image viewer parallax coincides i.e., a graph (Fig. 3 (A)) in the horizontal direction of movement of the sight line ; graph showing the eye movement in the vertical direction (FIG. 3 (b)); and the observation conditions from the image viewer 10 degrees rotation to the right, the line connecting the horizontal axis of the two stereoscopic image viewer 10 degrees deviation under a graph showing the line of sight moves in the horizontal direction (FIG. 3 (c)); represents a graph (FIG. 3 (d)) of the line of sight moves in the vertical direction. 图3中的纵轴表示被换算为显示器上的位置的视线的相对移动量，是指将图4所示的显示器的显示尺寸设为I时的移动量。 FIG 3 is converted to a vertical axis indicates the relative movement amount gaze position on the display means displays the size of the display shown in FIG. 4 when the set amount of movement I. 即，水平方向的移动量利用与将显示器的横宽设为I时的比值表示，垂直方向的移动量利用与将显示器的高度设为I时的比值表示。 That is, using the amount of movement in the horizontal direction and the horizontal width of the monitor is set at a ratio of I is represented by a vertical direction movement amount ratio of the height to the display time of I represented. 另外，将观察没有任何输出的暗画面的状态(没有靶标)下的视线位置的平均值设为O。 Further, the output of the observation state without any dark picture (no target) position of the average value of the line of sight under O. 在图3 (a)和图3 (c)中，将向左移动表示为负的值，将向右移动表示为正的值。 In FIG. 3 (a) and 3 (c), the leftward movement is represented as a negative value, shifted to the right is expressed as a positive value. 在图3 (b)和图3 (d)中，将向上移动表示为负的值，将向下移动表示为正的值。 In FIG. 3 (b) and 3 (d), the upward movement is represented as a negative value, the downward movement is expressed as a positive value. 横轴表示时间，单位是秒。 The horizontal axis represents time in seconds. 将每隔约17ms测定的左眼的视线用〇表示，将右眼的视线用X表示。 The left eye was measured about every 17ms sight represented by square, represented by the right-eye gaze X. 在本实验中，数据是以40岁女性为被实验者得到的数据。  In this experiment, the data is the data for the 40-year-old female experimenter to be obtained. 显示器配置于距视听者脸部90cm的位置。 A display arranged at a position 90cm from the viewer's face. 如图4所示，在黑色背景下提示出空白的十字图形作为靶标。 As shown, a blank suggesting cross pattern on a black background as a target 4. 将靶标提示于视听者正面，以图形的进深为处于距显示器表面为30cm、IOcm的里侧、距显示器表面为10cm、30cm、50cm、70cm的近前侧的方式调节视差，形成立体图形。 The targets are prompted to the viewer the front, to the depth pattern as being from the display surface of 30cm, IOcm the back side from the display surface of 10cm, 30cm, 50cm, embodiment the front side of 70cm was adjusted parallax to form three-dimensional pattern. 在提示没有靶标的画面5秒钟后，按照上述顺序提示各进深设定的画面各5秒钟。 After the target picture is not prompted for 5 seconds, each of the prompts in the above order of the depth setting screen for each 5 seconds. 在图3 (a)中，对于处于显示器里侧的靶标，右眼观察右侧(负侧)、左眼观察左侧(正侧)，对于处于显示器近前侧的靶标，右眼观察左侧(正侧)、左眼观察右侧(负侧)。 In Figure 3 (a), is the target for the back side of the display, the right eye was observed (negative side), left eye left side (positive side), the target for display in the front side, the left eye observation ( positive side), left eye right side (negative side). 在图3 (b)中，在提示靶标的期间，与进深无关，两眼的垂直方向的位置是固定的。 In Figure 3 (b), during the target prompt, and regardless of the depth, the vertical position of the two is fixed. 在画面的水平轴与连接视听者的两眼的线段不平行的情况下，图3 (c)所示的水平方向的视线的移动量比图3 (a)所示没有倾斜时减少。 In the case of the horizontal axis line segment connecting the eyes of the viewer is not parallel to the screen, the line of sight (c) in the horizontal direction shown in FIG. 3 FIG. 3 is moved to reduce the ratio of (a) When no tilt FIG. 图3 (d)所示的垂直方向的视线是在显示器的里侧右眼稍微观察下侧(正侧)、左眼稍微观察上侦仪负侧)，在显示器的近前侧右眼观察上侧、左眼观察下侧。 Gaze FIG. 3 (d), is slightly observed in the vertical direction lower side (positive side) in the right rear side of the display, the left eye is slightly observed on the meter detect negative side) was observed on the right side of the front side of the display , the lower side of the left eye. 但是，在距显示器为70cm的近前侧，左眼的视线观察与右眼相同的位置。 However, in the near distance 70cm to the side of the display, the right-eye observation of the same line of sight position. 这与在距显示器为70cm的近前侧的条件下不能形成左右图像的融像(视听者内观报告)相吻合。 This is consistent with the left and right images can not be formed at 70cm from the front side of the display is a fusion conditions (viewing the report viewer). 通过该实验表明了在显示器位置偏差等画面的水平轴与连接视听者的两眼的线段不平行的情况下，将产生在观察实际空间或者平面图像时不会产生的上下相反方向的眼睛移动。 By this experiment show that in the case of the line segment connecting two horizontal axis viewer's display screen positional deviation and the like are not parallel, it will produce the opposite direction of the eyes when viewed in the vertical plane or the real space image is not generated. 由此，表明在HMD的佩戴位置偏差的状态下视听立体图像的视听者的负荷非常高。 Thereby, show viewer viewing a stereoscopic image in the positional deviation of the HMD wearing state of the load is very high. 下面，关于本发明的头戴式显示器及其位置偏差调整方法，参照附图进行详细说明。  Hereinafter, the position of the head mounted display and a bias adjustment method of the present invention, described in detail with reference to the drawings. 首先，说明本发明的实施方式I的头戴式显示器及其位置偏差调整方法。  First, an embodiment of the present invention, a head-mounted display and I of the positional deviation adjustment method. · 图5是本实施方式的头戴式显示器I的结构图。 *  FIG 5 is a configuration diagram of the head mounted display of the embodiment I of the present embodiment. 该头戴式显示器I是即使是被安装成偏离头部时，也能够抑制其视听者产生立体视的异常、视听时的疲劳或者影像眩晕的HMD，该头戴式显示器I具有:输入部110，接受来自视听者的操作指示；位置取得部100，取得视听者的内眼角和瞳孔的位置；眼球位置校准部40，根据由位置取得部100检测出的内眼角和瞳孔的位置，取得瞳孔和内眼角的标准位置；标准位置存储部50，存储由眼球位置校准部40计算出的瞳孔和内眼角的标准位置•'位置偏差检测部60，根据在标准位置存储部50中存储的瞳孔和内眼角的标准位置、与由内眼角检测部30从利用摄像机10新拍摄的图像中检测出的内眼角位置的偏差；图像存储/接收部120，存储图像或者通过通信路径接收图像信息；图像处理部70，使在HMD的右眼用和左眼用的显示器中显示的图像(从图像存储/接收部120取得的图像)，对应  I is the head mounted display is mounted even when the head deviates, it is possible to suppress the generated stereoscopic viewer abnormality, fatigue or motion sickness when viewing an HMD, head mounted display I having: an input unit 110, receives an operation instruction from the viewer; position acquisition unit 100 acquires the position of the eyes and pupils of the viewer; eyeball position calibration unit 40, in accordance with the inner corner of the eye and the pupil acquired by the position of the unit 100 detects a position, obtaining a standard position of the pupil and the inner corner of the eye; 50, the standard position memory calculated by the eyeball position calibration unit 40 of the pupil and the inner corner of the standard position memory unit • 'positional deviation detecting unit 60. the memory 50 standard position storage unit standard position of the pupil and the inner corner of the eye, the inner corner of the eye position detected from the image newly captured by the camera 10 by the corner detecting section 30, a deviation; image storing / reception unit 120, stores the image or received through a communication path image information; the image processing unit 70, image (image acquired from the image storage / receiving unit 120) shown in the right and left eyes in the HMD display, the corresponding 由位置偏差检测部60检测出的位置偏差而旋转以及沿垂直方向和水平方向移动；一季显示器80，分别显示左右的图像。 Detected by the position deviation detecting unit 60 is rotated and the moving position deviation in the vertical and horizontal directions; season display 80, left and right images are displayed. 在此，为了明确有关眼睛的用语的意思，在图6中示出了内眼角和眼球和瞳孔的位置。  Here, in order to clarify the meaning of terms related to the eye, shown in FIG. 6 and the location of the inner corner of the eye and the pupil. 内眼角的位置是内眼角的上眼皮和下眼皮连接起来的接合部分的点，瞳孔是眼球中的黑眼球的中心。 The position of the inner corner is a point bonded portion of the upper eyelid and lower eyelid connecting inner corner of the eye, the pupil center of the eye is a black eye. 输入部110是接受来自视听者的操作指示的开关或者旋钮等输入设备，从视听者受理使该头戴式显示器I的动作开始/结束的指示等。  The input unit 110 is a switch or knob to accept an operation instruction from the viewer input device such that the operation of the head-mounted display receives a start I / end instruction or the like from the viewer. 位置取得部100是测量视听者的内眼角或者外眼角相对于显示器80的位置的处理部，包括:摄像机10，拍摄内眼角和眼球；睛孔检测部20，从由摄像机10拍摄的图像中检测瞳孔；以及内眼角检测部30，从由摄像机10拍摄的图像中检测内眼角。  The position obtaining section 100 is to measure the inner corner or a outer corner of the viewer with respect to the processing position of the display 80, comprising: a camera 10, photographing the eye and the eye; eye aperture detecting section 20, from the captured by the camera 10 detecting a pupil image; and an inner corner detecting section 30, the inner corner of the eye detected from an image captured by the camera 10. 摄像机10是测量视听者的瞳孔与显示器80的相对位置的传感器的一例(数字摄像机等摄像装置)，在此，摄像机10受理视听者利用开关或旋钮等输入部110进行操作的控制信号，将显示开始、显示结束、显示切换等控制信号输入的定时设为0时，每隔一定时间间隔例如IOms反复进行拍摄。  The camera 10 is an example of a sensor measuring the relative position of the viewer's pupil and the display 80 (the digital camera or the like device), in this case, the camera 10 receives viewer utilization of a switch or knob to input unit 110 operates a control signal the display start, display end, a display timing control signal input to switch the like 0:00, e.g. IOms given time interval shooting is repeated. 摄像机10可以是利用可见光进行拍摄的装置，也可以是具有红外线发光部并进行基于红外线的拍摄的装置。 Camera 10 may utilize the visible light imaging means, may be infrared light emitting portion and having an infrared imaging apparatus based. 眼球位置校准部40是这样的处理部:根据在显示器80不显示三维影像的状态(即没有任何供视听者观察的东西的状态)下由位置取得部100取得的视听者的瞳孔与显示器的相对位置，决定视听者的内眼角或者外眼角的标准位置，将所决定的标准位置存储在标准位置存储部50中，在此是根据由位置取得部100检测出的内眼角和瞳孔的位置计算瞳孔和内眼角的标准位置。  eyeball position calibration unit 40 is a processing unit: the pupil of the viewer 100 acquisition unit under the state of three-dimensional image is not displayed on the display 80 (i.e. without anything that were for viewing the observed state) acquired by the position the relative position of the display, determines the eye viewer or standard position of the outer corner, the standard position storage determined in the standard position storage section 50, in this case according to the eyes and the pupil acquired by the position of the unit 100 detects a calculating the standard position of the pupil and the position within the eye. 另外，所谓“标准位置”是指在视听者没有偏差地佩戴了头戴式显示器I时、视听者的内眼角和外眼角至少一方相对于头戴式显示器1(或者显示器80)的位置，在本实施方式中，是指在视听者佩戴了头戴式显示器I的状态下进行的校准中的视听者的内眼角和外眼角至少一方的位置。 Further, the so-called "normal position" means no deviation when the viewer wears the head-mounted display to I, the inner corner and the outer corner of the eye of the viewer with respect to at least one of a position of the head-mounted display (or the display 80), and in in the present embodiment, it refers to a viewer wearing the inner corner and the outer corner position of the calibration performed in a state where the head mounted display I in at least one viewer. 标准位置存储部50是硬盘等，取得在由眼球位置校准部40进行的校准中由位置取得部100测量的视听者的内眼角或者外眼角的位置，并存储为标准位置，在此是保存由眼球位置校准部40计算出的标准位置。  Standard position storage unit 50 is a hard disk and the like, to obtain the position of the inner corner or a outer corner of the viewer acquisition section 100 measured by the position of the calibration performed by the eyeball position calibration unit 40, and stored as a standard position in which save the standard position is calculated by the eyeball position calibration unit 40. 位置偏差检测部60是这样的处理部:检测由位置取得部100新测量的正在视听内容的视听者的内眼角或者外眼角相对于显示器80的位置、与在位置存储部中存储的视听者的标准位置之差，并作为位置偏差。  The positional deviation detecting unit 60 is a processing unit: detecting the corner or the outer corner of the eye of the viewer section 100 newly measured is viewing the content acquired by the position relative to the display 80, stored in the position storage portion difference between the standard position of the viewer, and as the positional deviation. 图像存储/接收部120是预先保存提示给视听者的三维影像的硬盘等存储器、或者通过无线等通信路径从外部接收三维影像的通信接口。  The image storing / receiving unit 120 is previously stored three-dimensional image presented to the viewer of the hard disk memory, or a communication interface receiving three-dimensional image from the outside through the wireless communication path and the like. 图像处理部70是这样的处理部:在由位置偏差检测部60检测出位置偏差时，以使显示于显示器80的三维影像(即从图像存储/接收部120发送的三维影像)按照检测出的位置偏差而旋转或者平行移动的方式，对该三维影像进行图像处理，图像处理部70接受来自存储图像或者接收图像信息的图像存储/接收部120的输入，并进行所输入的图像的处理。  The image processing unit 70 is a processing unit: when the deviation from the 60 detected position deviation detecting section, so that the display on the display 80 of the three-dimensional image (i.e., the three-dimensional video image storing / receiving unit transmitted 120) in accordance with positional deviation detected in parallel or rotationally movable manner, the three-dimensional video image processing, the image processing unit 70 receives an input image stored in the storage or receiving image information from image / reception unit 120, and the input image deal with. 更具体地讲，图像处理部70进行使构成提示给视听者的三维影像的左眼用和右眼用的图像分别旋转的处理、以及使左眼用和右眼用的图像沿水平方向和垂直方向移动的处理，或者进行用于将该左眼用和右眼用的图像中任意一方作为左右两眼用的图像显示于显示器80的图像处理(二维化处理)。  More specifically, the image processing unit 70 processes constituting the three-dimensional image presented to the viewer left eye image and the right eye are rotated, and the left-eye image and the right eye in the horizontal and vertical movement process, or by a left-eye image and the right eye as either one of left and right eyes of the image displayed on the display image processing (two-dimensional processing) 80. 即，在由位置偏差检测部60检测出的位置偏差的量超过预先设定的值的情况下，该图像处理部70进行用于将构成提示给视听者的三维影像的左眼用和右眼用的图像中任意一方作为左右两眼用的图像显示于显示器80的图像处理，另一方面，在由位置偏差检测部60检测出的位置偏差的量未超过预先设定的值的情况下，图像处理部70进行使左眼用和右眼用的图像分别旋转的处理、以及使左眼用和右眼用的图像沿水平方向和垂直方向移动的处理。 In other words, the amount of deviation detected by the position deviation of the position detecting section 60 exceeds a predetermined value, the image processing unit 70 for constituting the three-dimensional image presented to the left eye of the viewer with the right eye and either one of the image for left and right eyes as the image displayed on the display 80 of the image processing, on the other hand, the amount of deviation detected by the position deviation detecting unit 60 when the value does not exceed a position set in advance, the image processing unit 70 for processing the left-eye and right-eye images are respectively rotated by, and the left-eye and the image processing in the horizontal and vertical directions with the movement of the right eye. 另外，显示器80是显示三维影像的IXD等，受理视听者利用开关或旋钮等输入部110进行操作的控制信号，并进行显示开始、显示结束、显示切换等。  Further, the display 80 is a three-dimensional image IXD like, and receives a control signal viewer switches or the like using the knob 110 operates the input unit, and display start, display end, the display switching and the like. 另外，在图5中，用虚线框包围的构成要素(眼球位置校准部40、输入部110、图像存储/接收部120)不是本发明的头戴式显示器I的必须要素。  Further, in FIG. 5, the head-mounted display components (eyeball position calibration unit 40, an input unit 110, image storage / receiving unit 120) surrounded by the dashed box I of the present invention is not to be elements. 即，头戴式显示器I具有:显示器80，显示三维影像；位置取得部100，测量视听者的内眼角或者外眼角相对于显示器80的位置；标准位置存储部50，取得在用于决定与该位置相关的标准位置的校准中测量出的内眼角或者外眼角的位置，并存储为标准位置；位置偏差检测部60，检测新测量出的正在视听内容的视听者的内眼角或者外眼角相对于显示器80的位置与标准位置之差，并作为位置偏差；以及图像处理部70，以使显示于显示器80的图像三维影像对应于检测出的位置偏差而旋转或者平行移动的方式，对三维影像进行图像处理，由此即使视听者的视线移动了，也能够与视线无关地根据不移动的内眼角或者外眼角与显示器80的相对位置，校正眼睛与显示器80的相对位置的偏差，由此防止由于眼睛与显示器80的相对位置的偏差而造成的立体视的异常或疲劳和影像眩 That is, the head-mounted display I includes: a display 80, a three-dimensional image display; position acquisition unit 100, the inner corner or outer corner of the eye measured viewer position relative to the display 80; standard position storage unit 50, acquires for determining the calibration position associated with the standard position of the measured position of the inner corner or a outer corner of the eye, and stored as a standard position; positional deviation detecting unit 60 detects the eye or an outer corner of the eye of the viewer is viewing the contents of the newly measured with respect to display difference 80 position and the standard position of, and as a position deviation; and an image processing unit 70, so that the display on the display 80 of the image three-dimensional image corresponding to the positional deviation detected rotate or move in parallel manner, the three-dimensional images for image processing, whereby even if the viewer moves the line of sight, it is possible irrespective of the line of sight without moving the relative position of the outer or inner corner of the corner of the display 80, the correction of the deviation of the relative position of the eyes and the display 80, thereby preventing the eyes and the monitor abnormality or deviation dizzy stereoscopic image and fatigue caused by the relative position of the 80 晕。 gosh. 另外，摄像机10和显示器80都是按照右眼用和左眼用设置了两个。  Further, the camera 10 and the display 80 are in accordance with the right and left eyes are provided two. 在区分左右进打说明时，将左眼用摄像机表述为摄像机10L、将右眼用摄像机表述为摄像机10R、将左眼用显示器表述为显示器80L、将右眼用显示器表述为显示器80R进行区分。 At around differentiate into play instructions, expressed using the left-eye camera to the camera 10L, the right-eye camera is expressed as the camera 10R, the left eye is expressed as a display monitor 80L, the right-eye display to distinguish 80R expressed as a display. 另外，瞳孔检测部20、内眼角检测部30、眼球位置校准部40、位置偏差检测部60、图像处理部70例如是利用一个以上的CPU、一个以上的存储器、和由该CPU执行的程序实现的。  Further, pupil detecting section 20, the corner detecting section 30, the eyeball position calibration unit 40, a positional deviation detecting unit 60, an image processing unit 70, for example, the use of more than one CPU, at least one memory, and executed by the CPU the program implementation. 另外，标准位置存储部50是利用一个以上的存储器实现的。 Further, the standard position storage unit 50 is implemented using one or more of memory. 图7是本实施方式的图像处理部70的具体结构图。  FIG. 7 is a specific configuration diagram of an image processing unit of the embodiment 70 of the present embodiment. 图像处理部70包括判定部71、旋转计算部72、图像存储部73、旋转处理部74、平行移动计算部75、平行移动处理部76、以及左右图像控制部77。  The image processing unit 70 includes a determination section 71, the rotation calculation unit 72, an image storage unit 73, the rotation processing unit 74, computing unit 75 moves in parallel, the parallel movement processing section 76, a control unit 77 and the left and right images. 判定部71将位置偏差检测部60计算出的当前的内眼角的位置与内眼角标准位置的距离、和预先设定的基准值进行比较。  The position determination unit 71 from the positional deviation detecting unit 60 calculates the current corner and the inner corner of the standard position, and a predetermined reference value. 通过判定部71的判定，在判定为当前的内眼角的位置与内眼角标准位置的距离小于基准值的情况下，旋转计算部72计算表示由于HMDl的佩戴位置的偏差而造成的、显示器80与视听者的眼睛的位置偏差的坐标变换中基于旋转的部分。  The determination by the determination unit 71, in a case where the determination is less than the reference value from the position of the standard inner corner of the current location of the inner corner, the rotation calculation unit 72 calculates a due to the deviation wearing position HMDl is caused, rotating coordinate conversion section 80 and the position deviation of the eye based on the viewer's display. 通过判定部71的判定，在判定为当前的内眼角的位置与内眼角标准位置的距离小于基准值的情况下，平行移动计算部75计算表示由于头戴式显示器I的佩戴位置的偏差而造成的、显示器80与视听者的眼睛的位置偏差的坐标变换中基于平行移动的部分。  By judging unit 71, in a case where it is determined that the current position from the inner corner with standard inner corner position is less than the reference value calculation unit 75 calculates parallel movement due to wear represents the position of the head-mounted display I deviation caused by deviation coordinate transformation and 80 positions of the eyes of the viewer in the display portion based on parallel movement. 图像存储部73是暂时存储在显示器80中显示的三维影像的缓冲存储器。  The image storage unit 73 is a buffer memory for temporarily storing the three-dimensional image displayed on the display 80. 旋转处理部74对在图像存储部73中存储的三维影像实施通过旋转计算部72得到的旋转。  The embodiment of the rotation processing unit 74 by the rotation of the rotary obtained three-dimensional image calculating unit 72 in the image storage unit 73. 平行移动处理部76对在图像存储部73中存储的三维影像实施通过平行移动计算部75得到的平行移动。  The parallel processing unit 76 moves parallel movement by the parallel embodiment of the mobile computing unit 75 to obtain the three-dimensional video image storage unit 73. 左右图像控制部77对在图像存储部73中存储的三维影像进行这样的图像处理:将构成该三维影像的左眼用和右眼用的图像中任意一方作为左右两眼用的图像显示于显示器80。  left and right image control unit 77 performs such image processing in the three-dimensional video image storage unit 73: constituting the left eye and right eye image of the three-dimensional image as either one of left and right eyes of the image displayed on the display 80. 例如，将左眼用图像替换为右眼用图像。 For example, the left-eye image is replaced with the right-eye image. 另外，图像存储部73是利用一个以上的存储器实现的，判定部71、旋转计算部72、旋转处理部74、平行移动计算部75、平行移动处理部76、左右图像控制部77是利用一个以上的CPU、一个以上的存储器、和由该CPU执行的程序实现的。  Further, the image storage unit 73 is the use of more than one memory implementation, the determination unit 71, the rotation calculating portion 72, the rotational processing portion 74, parallel movement calculating section 75, the parallel movement processing section 76, the left and right image control unit 77 is using more than one CPU, at least one memory, and the program executed by the CPU achieved. 图8是表示在利用软件实现本实施方式的头戴式显示器I的处理部时使用的硬件结构的块图。  FIG. 8 is a block diagram of a hardware configuration used in a software implementation using a head-mounted display of the embodiment according to the present embodiment of the processing unit I. 在从软件上实现本实施方式的头戴式显示器I的处理部的情况下，如图8所示，能够利用计算机220实现本实施方式的头戴式显示器1，该计算机220由键盘和鼠标等输入部211、硬盘等存储部212、显示器装置等输出部213、CPU214、R0M215、RAM216、以及与外部设备之间进行信号的输入输出的输入输出I/F217构成。 In the case of the head-mounted display processing section I of this embodiment is realized from the software, shown in Figure 8, computer 220 can be implemented using a head-mounted display of the embodiment 1 of the present embodiment, the computer 220 by a keyboard and a mouse input-output I signal inputs and outputs between the output portion of the input unit 211, a hard disk unit 212, a display device or the like 213, CPU214, R0M215, RAM216, and with external devices / F217 configuration. S卩，图5中的输入部110主要利用计算机220具有的存储部212或输入部211实现，图5中的显示器80主要利用计算机220具有的输出部213实现，图5中的图像存储/接收部120主要利用计算机220具有的输入输出I/F217实现，图5中的标准位置存储部50主要利用计算机220具有的存储部212实现，其它处理部(瞳孔检测部20、内眼角检测部30、眼球位置校准部40、位置偏差检测部60、图像处理部70)是通过按照在计算机220具有的R0M215或者存储部212中存储的程序，将RAM216用作暂时的存储区域，并由CPU214执行而实现的。 S Jie, 5 an input unit 110 mainly uses a computer 220 having a storage unit 212 or the input unit 211 implemented, the output unit 5 of the display 80 mainly using a computer 220 having a 213 to achieve image storage 5 / reception 120 mainly uses a computer unit 220 having an input output I / F217 implemented standard position storage section in FIG. 550 mainly uses a computer 220 having a storage unit 212 realized, 20, the corner detecting section 30 the other processing unit (pupil detection unit, eyeball position calibration unit 40, a positional deviation detecting unit 60, an image processing unit 70) by the computer 220 in accordance with the R0M215 storage unit 212 or a program, the RAM216 as a temporary storage area by executing the program CPU214 of. 图9是表示如上所述构成的本实施方式的头戴式显示器I的处理步骤的流程图，即表示本发明的调整头戴式显示器I的位置偏差的方法的图。  FIG. 9 is a flowchart of the processing steps of the present embodiment described above, the head-mounted display configuration I of the embodiment, i.e., a diagram illustrating a head-mounted display of the present invention to adjust the positional deviation of the I method. 图10、图14、图15是详细表示头戴式显示器I的处理步骤(图9的流程图)的一部分步骤的图。 FIG 10, FIG 14, FIG 15 is a detailed view showing a part of the head-mounted display step I processing steps (the flowchart of FIG. 9) of the. 下面按照图9、图10、图 Here in FIG. 9, FIG. 10, FIG. 14、图15来说明处理步骤。 14, process step 15 will be described. 首先，视听者佩戴HMD1，并使用输入部110进行指示视听开始的输入(S110)。  First, a viewer wearing the HMD 1, using the input unit 110 and viewing start instruction input (S110). 在刚刚进行视听开始输入后，眼球位置校准部40在显示器80没有显示的状态下检测瞳孔和内眼角，进行将瞳孔和内眼角的相对位置决定为标准位置的校准(S120)。 Be viewed immediately after the start input, the calibration eyeball position detection portion 40 and the inner corner of the eye pupil at the state of the display 80, not shown, calibrated (S120) and the relative position of the inner corner of the pupil is determined as the standard position. 关于校准的具体步骤将在后面进行说明。 Specific steps of the calibration will be described later. 当在S120进行校准后，视听者通过利用输入部110进行指示等，进行影像内容的视听(S130)。  After calibration At S120, the viewer instructs the like by using the input unit 110, for viewing video content (S130). 在视听影像内容时，首先摄像机10判定是否从输入部110输入了指示三维视听结束的控制信号(S140)。 When viewing video content, the video camera 10 first determines whether or not a control signal (S140) indicating the end of the three-dimensional viewing input from the input unit 110. 在输入了指示三维视听结束的控制信号的情况下(S140:是)，HMDl结束动作(S190)。 In the case where the input control signal indicates the end of the three-dimensional viewing (S140: yes), HMDl ends the operation (S190). 在没有输入指示三维视听结束的控制信号的情况下(S140:否)，内眼角检测部30在摄像机10拍摄正在视听的视听者的眼睛的同时检测所述视听者的内眼角的位置。 In the absence of an input control signal indicates the end of the three-dimensional viewing (S140: NO), the corner detecting section 30 detects a position of the inner corner of the eye of a viewer while the viewer is viewing the camera 10 photographing the eye. 位置偏差检测部60计算在标准位置存储部50中存储的内眼角的标准位置与由内眼角检测部30检测出的内眼角的位置之偏差(S150)。 Positional deviation detecting unit 60 calculates the standard position at the inner corner of the standard position 50 stored in the storage unit and the deviations of the position of the inner corner of the corner 30 detects the detection unit (S150). 另外，位置偏差检测部60检测在S150计算出的位置偏差是否是超过了预先设定的允许范围的位置偏差(S160)。  Further, the detection unit 60 detects the positional deviation calculated in S150 whether the position deviation exceeds the allowable range of the positional deviation (S160) preset. 关于位置偏差的允许范围，例如设为将两眼的位置偏差进行合计得到的2mm。 On positional deviation allowable range, for example, to the two positional deviation obtained for total 2mm. 在其结果是内眼角的标准位置与摄像机10拍摄的内眼角的位置之间存在偏差(位置偏差超过允许范围)的情况下(S160:是)，图像处理部70进行按照内眼角位置的偏差使画面旋转并水平移动的处理(S170)。  In a result there is a deviation between the position of the inner corner of the camera 10 photographing the inside corner of the standard position (position deviation exceeds the allowable range) in the case (S160: Yes), the image processing unit 70 in accordance with the position of the inner corner rotational deviation so that the screen and the horizontal movement of the processing (S170). 另一方面，在内眼角的标准位置与摄像机10拍摄的内眼角的位置之间不存在偏差的情况下(S160:否)，图像处理部70不对所输入的图像进行处理，而是将图像输出给显示器80 (SlSO)0另外，在视听如上所述的影像内容的期间(S130)反复执行步骤S140〜S180。 On the other hand, the absence of a deviation between the position of the inner corner of the eye, including the standard position captured by the camera 10 (S160: NO), the image processing unit 70 does not perform the input process, but the output image to the display 80 (SlSO) 0 Further, during the repeated steps S140~S180 of viewing video contents as described above (S130). 如上所述，本实施方式的头戴式显示器I的位置偏差调整方法是调整在头戴式显示器I中显示的三维影像的位置偏差的调整方法，其主要步骤包括:显示步骤(S180等)，在显示器80显示三维影像；位置取得步骤(S120、S150等)，测量视听者的内眼角或者外眼角相对于显示器80的位置；标准位置存储步骤(S120)，将在用于决定与该位置相关的标准位置的校准中通过位置取得步骤而测量出的内眼角或者外眼角的位置作为标准位置存储在标准位置存储部50中；位置偏差检测步骤(S150、S160)，检测通过位置取得步骤而新测量的正在视听内容的视听者的内眼角或者外眼角相对于显示器80的位置、与标准位置之差，并作为位置偏差；以及图像处理步骤(S180)，在通过位置偏差检测步骤而检测出位置偏差时(S160:是)，以使显示于显示器80的三维影像根据所检测出的位置偏差而旋  As described above, the present embodiment of the head-mounted display of the embodiment I positional deviation adjustment is to adjust the adjustment method of positional deviation in the three-dimensional image display in the head-mounted display I, the main step comprises: a display step (S180 etc. ), the display 80 displays three-dimensional image; a position obtaining step (S120, S150, etc. ), measurement of the inner corner or outer corner of the eye of the viewer relative to the display 80; standard position storage step (S120), and will be used to determine calibration of the position of the relevant standard location and measured by the position obtaining step position of the inner corner or a outer corner of the eye as the standard position stored in the standard position storage section 50; and a positional deviation detecting step (S150, S160), detected by the position acquiring viewer is viewing the contents of the step of the new measurement inner corner or a outer corner of the eye with respect to the difference between the position of the display 80, and the standard position of, and as a position deviation; and an image processing step (S180), by the positional deviation detecting step when the positional deviation is detected (S160: yES), so that the three-dimensional image displayed on the display 80 in accordance with the positional deviation detected screwed 或者平行移动的方式，对三维影像进行图像处理。 Or the parallel movement mode, performs image processing on the three-dimensional image. 由此，根据本实施方式的头戴式显示器I的位置偏差调整方法，即使是视听者的视线移动时，也能够与视线无关地根据不移动的内眼角或者外眼角与显示器80的相对位置校正眼睛与显示器80的相对位置的偏差，因而能够防止由于眼睛与显示器80的相对位置的偏差而造成的立体视的异常或疲劳和影像眩晕。  Accordingly, the position deviation adjustment method of a head-mounted display of the embodiment I of the present embodiment, even if the line of sight of the viewer moves, it is possible according to the line of sight regardless of the inner corner or outer corner of the display 80 does not move the correcting relative positional deviation of the relative position of the eyes and the display 80, it is possible to prevent abnormal or fatigue and dizziness stereoscopic image due to deviation of the relative position of the eyes and the display 80 caused. 在此，按照图10详细说明图9所示的S120的校准步骤。  Here, FIG. 10 S120 according to the calibration step shown in FIG. 9 in detail. 首先，在校准的最初阶段，在显示器80没有任何显示的状态下(S121)，利用摄像机10拍摄包括视听者的眼睛整体的范围(S122)。  First, at the initial stage of the calibration, the display 80 without any status display (S121), captured by the camera 10 includes the entire range of the viewer's eyes (S122). 瞳孔检测部20和内眼角检测部30从在S122拍摄的图像中分别切取瞳孔所在的部分和内眼角所在的部分(S123)。 Part (S123) are cut out pupil detection section 20 and the inner corner detecting section 30 from the image captured in S122 where the pupil portion and the inner corner of the eye are located. 例如，如图6所示，瞳孔检测部20切取将在S122拍摄的包括眼睛的图像纵向分割为三部分后的中央的三分之一部分作为瞳孔用，内眼角检测部30切取在S122拍摄的鼻子侧的三分之一部分作为内眼角识别用。 For example, shown in Figure 6, the pupil detection unit 20 including the cut image of the eye captured in S122 is divided into a third of the longitudinal center of the pupil as a three-part, the corner detecting section 30 in S122 cut shooting the nose portion of the third side of the recognition as the inside corner. 然后，内眼角检测部30识别内眼角的特征性的上眼皮和下眼皮所形成的形状(S124)。  Then, the shape (S124) recognition features of the corner 30 of the upper eyelid and the corner detecting section formed by the lower eyelid. 识别的方法例如是保存多个典型的内眼角形状的模型，将图像中的形状与模型进行核对的方法。 The method of identification is stored, for example, a typical model of a plurality of inside corner shape, the shape of the image of the model checking method. 关于内眼角形状的模型的信息，例如保存如图11所示的“模型ID”、将相似的模型进行汇总得到的“类型”、模型图形以及模型图形中的内眼角位置的信息(图中的“模型”)。 Model information regarding the shape of the inner corner, for example, as shown in FIG save "Model ID" shown in FIG. 11, the model is similar to the "type" obtained summary, the position of the inner corner model and a model graphic pattern information (FIG. "model"). 内眼角检测部30根据吻合的模型中的内眼角位置决定图像中的内眼角位置。 The corner detecting section 30 determines the corner position of the image in accordance with the position of the inner corner of the anastomosis model. 模型也可以不是图形，而是利用线段的斜率和角度这样的特征量进行记述。 You can not model pattern, but this feature is described using the amount and angle of inclination of the line segment. 眼球位置校准部40决定在图像中识别出的内眼角的坐标上的位置(S125 )。  position (S125) on the coordinate calibration unit 40 determines the position of the eyeball recognized in the inner corner of the image. 例如，利用将连接左右显示器的线段作为X轴、将与其平行的方向作为I轴的坐标平面来表示位置。 For example, by using a line segment connecting the left and right of the monitor as an X-axis, a direction parallel to the axis of the coordinate plane I denote locations. 把X轴的0点设为例如摄像机IOL和摄像机IOR的摄像范围的中间点。  The X-axis is set to 0:00, for example, an intermediate point of the imaging range of the camera IOL and IOR camera. 将y轴的0点设为例如摄像机10的上下方向的中心。 The y-axis is set to 0:00, for example, the center of the camera 10 in the vertical direction. 在图12中，X轴的0点位于都偏离摄像机IOL和摄像机IOR的摄像徂围的位直。 In FIG 12, the zero point are located in the X-axis position offset from the imaging camera CU IOL and IOR of the camera around the straight. 坐标系被设定为反映出摄像机IOL和摄像机IOR的摄像范围的实际位置关系。 Coordinate system is set to reflect the relationship between the actual position cameras and camera IOL IOR camera range. 在摄像机IOL和摄像机IOR的摄像范围重合的情况下，视为X轴的0点包含在两个摄像范围中。 In the case where the imaging range of the camera and the camera IOL IOR coincident, regarded as the X-axis is included in the zero point two imaging ranges. 瞳孔检测部20与步骤S124的处理(内眼角识别)并行地或者顺序地、从在S123切取出的中央的三分之一部分的图像中用椭圆形确定颜色比周围深的部分，并识别瞳孔(S126)。 Processing (recognition inner corner) in parallel or sequentially, to determine the color darker than the surrounding portions of the image by one-third portion of the elliptical center cut extracted in S123, pupil detecting section 20 and the step S124 and the identification pupil (S126). 关于瞳孔，在虹膜的颜色较深时识别虹膜的轮廓，在虹膜的颜色较浅时识别瞳孔的轮廓。 On the pupil, the iris color darker outline identifying the iris, pupil shallow profile identifying the color of the iris. 并且，眼球位置校准部40将被识别为瞳孔的虹膜或者瞳孔的椭圆中心决定为瞳孔的位置(S127)。 Further, the eyeball position alignment portion 40 will be recognized as the pupil or the iris of the pupil center of the ellipse is determined as the position of the pupil (S127). 位置利用与内眼角相同的坐标平面表示。 Using the position of the inner corner of the same coordinate plane. 另外，眼球位置校准部40决定标准的图像显示位置(S128)。  Further, the position of the eyeball 40 determines a calibration standard unit of the image display position (S128). 关于图像显示位置，对于显示器80L是将在S127决定的左瞳孔位置的正面作为图像中心位置，对于显示器80R是将在S127决定的右瞳孔位置的正面作为图像中心位置。 Front right pupil position of the image on the front display position for the display will be decided at S127 80L is left pupil position of the image as a central location for the display 80R is determined in S127 as an image center position. 并且，标准位置存储部50存储眼球位置校准部40在S125决定的左右内眼角位置(S129)。 Further, the storage unit 50 stores the standard position eyeball position calibration unit 40 in the left and right corner position determined S125 (S129). 在此，在标准位置存储部50中存储的数据例如是如图13所示利用二维坐标表示左右内眼角的标准位置的数据。 Here, the standard position data stored in the storage unit 50 is shown, for example, a two-dimensional coordinate data indicating the standard position of the left and right inner corner 13 of FIG. 这样，通过在观察没有任何显示的暗的显示器80的状态下确定瞳孔的位置，能够确定观察无限远处时的瞳孔位置，并作为标准位置设为图像显示的中心。  Thus, by determining the position of the pupil 80 is dark in the observation of the display without any display, it is possible to determine the position of the pupil when viewed at infinity, and set the standard position as the center of the image displayed. 虽然在欣赏影像的过程中瞳孔的位置随着视线而移动，但是内眼角的位置在欣赏影像的过程中不移动。 Although the position of the pupil moves with the line of sight in the process of appreciation of the image, but does not move the position of the inner corner of the appreciation in the course of the video. 通过设定内眼角的标准位置，在欣赏影像的过程中能够相对地求出观察无限远处时的瞳孔位置。 By setting the inner corner of the standard position, the process enjoy video images to determine the relative position of the pupil can be viewed at infinity. 另外，通过在观察没有任何显示的暗的显示器80的状态下确定瞳孔的位置，针对斜视或斜位等左右眼球的朝向存在偏差或者产生偏差的视听者，能够针对根本不产生负荷的眼球的朝向在左右各眼球的正面提示图像，而不是针对具有注视点时的产生负荷的眼球的朝向，因而能够对视听者进行注视用的眼球提示负荷较小的图像。 Further, by observing no dark display to display the determined position of the pupil in the state 80, there is a deviation toward squint or oblique the like around the eye or the viewer of bias can produce no eye load directed toward smaller prompt the front left and right eye images, rather than a load generated when the eye has towards the fixation point, it is possible for the viewer's gaze eye image tips load. 另外，瞳孔位置的信息仅用于决定图像在标准位置中的提示位置。  Further, only the information for determining the position of the pupil position of the image in the standard Tip position. 在视听影像时的瞳孔根据视听者在观察图像的何处而移动。 When viewing the image of the pupil is moved in accordance with the observation image where the viewer. 例如，在观察图像的右端而非中心的情况下，瞳孔在眼睛中偏向眼睛的右端。 For example, rather than right when viewed in the center of the image, toward the right end of the pupil of the eye in the eye. 因此，在视听影像时的瞳孔位置不一定适合作为图像的中心位置的指标。 Therefore, the position of the pupil when viewing the image may not be suitable as an indicator of the center of the image. 在此，在本实施方式中，仅在通过步骤S120的校准来确定标准位置时使用瞳孔位置，以后使用内眼角的位置调整与HMD的偏差对应的图像提示位置。 Here, in the present embodiment, a pupil position only when the standard position determined by the calibration in step S120, the deviation of the position adjustment for future use and the inner corner of the image corresponding to prompt the HMD position. 下面，按照图14的流程图详细说明图9所示的S150即计算内眼角的位置偏差的步骤。  Next, according to the flowchart of FIG. 14 described in detail S150 shown in FIG. 9 step i.e. the corner position deviation is calculated. 首先，利用摄像机10拍摄包括视听者的眼睛整体的范围(S151)。  First, the camera 10 shooting, including a whole range of the viewer's eyes (S151). 内眼角检测部30从在S151拍摄的图像中切取内眼角所在的部分(S152)。 Detecting part of the inner corner portion 30 is located inside corner cut out from the image captured in S151 (S152). 关于图像的切取，例如假设与S120的校准中的S123的切取相同地切取图像的鼻子侧三分之一部分。 About cut image, for example cut calibration assumed S120 S123 is taken in the same manner as the nose-side cut-third portion of the image. 并且，内眼角检测部30识别内眼角的特征性的上眼皮和下眼皮所形成的形状(S153)。 Further, the characteristic shape of the corner 30 of the inner corner identification unit detecting upper eyelid and the lower eyelid is formed (S153). 在此，识别的方法例如与S124相同地进行与模型的核对。 Here, the identification of methods and models, for example, collates the same manner as S124. 当在S124从多个模型中利用特定的模型确定出内眼角的情况下，内眼角检测部30存储在S124确定的模型，当在S153进行内眼角的识别时，仅使用所存储的在S124确定的模型或者该模型和与其相似的模型进行内眼角的识别，由此能够缩短处理时间。 When it is determined that a case where the inside corner, the corner detecting section 30 stores the model in the determination of S124, when the inner corner recognition at S153, using the stored only in S124 is determined using a specific model from a plurality of models in S124 the model or model and the model identifying similar thereto inner corner, whereby the processing time can be shortened. 在使用相似的模型的情况下，例如按照图11所示的模型的类型，仅将与在S124确定的模型相同类型的模型用于识别中。 In the case of using a similar model, for example, according to the type of the model shown in Figure 11, with only the model of the same type for identifying the model determined in S124. 然后，位置偏差检测部60决定在图像中所识别出的内眼角的位置(S154)。  Then, the position deviation detecting unit 60 determines the image in the identified position of the inner corner (S154). 关于该位置是在通过S125决定了校准时的内眼角位置的坐标轴上决定的。 This position is determined on the coordinate axis when the corner position is calibrated by the decision of S125. 另外，位置偏差检测部60计算在S129被存储于标准位置存储部50中的内眼角标准位置与在S154决定的内眼角的位置的距离(S155)，在S160进行位置偏差检测。 Further, the position deviation detecting section 60 calculates the position is stored in the inner corner 50 from the standard position storage section and the inner corner of the standard position determined in S154 (S155) in S129, the position deviation detected in S160. 下面，按照图15的流程图详细说明图9所示的S170的校正处理的步骤。  Next, according to the flowchart of FIG. 15 in step S170 of correction processing shown in FIG. 9 in detail. 首先，判定部71将在S155由位置偏差检测部计算出的当前的内眼角的位置与内眼角标准位置的距离、和预先设定的基准值进行比较(S171)。  First, the determination unit 71 at S155 from the position calculated by the position deviation detecting portion and the inner corner of the current standard inner corner position, and the preset reference value (S171). 在此，例如将基准值设为30mm，在当前的内眼角的位置与内眼角标准位置的距离为基准值以上的情况下，即在图15的S171为否的情况下，左右图像控制部77将左眼用的图像替换为右眼用的图像(S172)。 Here, for example, the reference value is set to 30mm, the distance and the position of the current position of the standard inner corner of the eye in the case where not less than the reference value, i.e., S171 in FIG. 15 is NO, the control unit 77 left and right images the left eye image is replaced with an image (S172) right eye. 即，通过对两眼提示相同的图像，进行二维影像的显示而非三维影像。 That is, the two tips of the same image, rather than the three-dimensional image display of two-dimensional image. 当在S171当前的内眼角的位置与内眼角标准位置的距离小于基准值的情况下，即在图15的S171为是的情况下，平行移动计算部75和旋转计算部72求出由于HMDl的佩戴位置的偏差而形成的显示器80与视听者的眼睛的位置的偏差作为坐标变换，旋转处理部74和平行移动处理部76进行用于补偿该坐标变换的图像的显示位置的坐标变换。 The  When the reference value is smaller than the distance from the standard position in the inner corner of the current position of the inner corner of the S171, i.e., in S171 of FIG. 15 is YES, the parallel movement and the rotation calculation unit 75 calculating unit 72 obtains display due to the deviation of the wearing position HMDl 80 is formed with a deviation of the position of the eyes of the viewer as coordinate transformation, the rotation processing unit 74 and the parallel movement processing unit 76 performs coordinate conversion for compensating a display position of the image of the coordinate transformation of . 图16是示意地表示显示器80与视听者的眼睛的位置的偏差的一例、和计算偏差作为坐标变换的过程的图。  FIG. 16 is a diagram schematically showing an example of the process of the position deviation of the eyes and the viewer's display 80, and calculates a deviation of a coordinate transformation. 图16(a)用实线表示在视听影像时利用摄像机10拍摄的眼球，用虚线表示在通过S120进行的校准中利用摄像机IOL拍摄的状态。 FIG 16 (a) represents the use of the eye camera 10 viewing the image captured at the time, picked up by the camera IOL shows a state in S120, the calibration performed by the solid line with the broken line. 左侧表示右眼用摄像机IOR的图像，右侧表示左眼用摄像机IOL的图像。 Denotes the left eye image camera IOR, and the right side shows the left-eye image by the camera of the IOL. 在视听影像时的瞳孔的位置根据视听者的注视点而移动。  When viewing pupil position of the image point is moved according to the viewer's gaze. 在注视点位于图像的端部的情况下，即使是显示器80与眼睛的位置没有偏差，瞳孔位置也大大偏离S120的校准时的标准瞳孔位置。 A case where an end of the gazing point in the image, even if the display 80 is no deviation of the position of the eye, the pupil position greatly deviated from the pupil position of the calibration standard in S120. 另一方面，即使是注视点移动时，内眼角也是固定的，能够更准确地捕捉显示器80与眼睛的相对位置。 On the other hand, even when the gazing point is moved, the inner corner is fixed, is possible to more accurately capture the relative position of the display 80 and the eye. 因此，通过图像处理部70进行用于补偿内眼角标准位置与内眼角的当前位置的偏差的图像变换处理，以便校正显示器80与眼睛的相对位置的偏差。 Thus, the image conversion processing performed by the deviation 70 of the current position to compensate for the inner corner of the standard position and the inner corner of the image processing unit 80 so as to correct the deviation of the display of the relative position of the eye. 在此，由于右眼内眼角与左眼内眼角的相对位置没有变化，因而用于实现从右眼内眼角标准位置向右眼内眼角当前位置的移动和从左眼内眼角标准位置向左眼内眼角当前位置的移动的坐标变换相当于仿射变换。  Here, since the relative position of the right eye and the left corner of the corner does not change, and thus the standard position for realizing the corner of the eye and moving the current position of the left corner from the standard position into the right eye from the eye corresponds to the coordinate transformation to move the current position of the left corner of the affine transformation. 已经公知二维的仿射变换能够通过旋转和平行移动来表现。 Already known two-dimensional affine transformation can be expressed by rotation and parallel movement. 因此，二维的仿射变换能够记述为如下面的式I所示。 Thus, the two-dimensional affine transformation can be described as the following Formula I as shown in FIG. 变换矩阵和变换向量是表示在S120的校准时设定的图像的中心与瞳孔位置的相对位置在当前怎样偏差的向量。  the transformation matrix and the transformation vector is the vector representing the relative position of the center of the image and the pupil position set at S120 in the current calibration how deviations. 因此，通过使用所得到的变换矩阵和变换向量的相反矩阵来处理图像，能够将图像变换成使图像中心点位于当前的瞳孔位置的正面。 Thus, by using the obtained transformation matrix and the transformation matrix of the opposite vector to process the image, the image can be converted into the current image to a center point located on the front of the pupil position. 作为实际的计算方法的一例，在此按照图16 (b)说明几何求出旋转和平行移动的方法。  As an example of practical calculation method, according to this FIG. 16 (b) illustrate the method of finding a geometric rotation and parallel movement. 通过将右眼或者左眼的内眼角标准位置作为中心，并以连接左右内眼角标准位置的线段和连接左右内眼角当前位置的线段所形成的角度e进行旋转，将从作为旋转中心的一侧的内眼角的标准位置到当前位置的向量作为移动向量进行平行移动，能够实现从左右内眼角的标准位置向左右内眼角的当前位置的变换。  By the right or left corner of the standard position as the center, and the left and right segments and connected to the standard position of the corner connection angle about the current position of the line segment e in the corner formed by rotation, from the rotation center the standard position of the inner corner of the side vector of the current position is moved in parallel as a motion vector, transformation can be achieved from a standard eye position within the eye into the left and right about the current location. 在此，以将右眼内眼角标准位置作为旋转中心求出变换矩阵的情况为例进行说明。 Here, the inner eye corner where the standard position is obtained as the rotation center of the transformation matrix will be described as an example. 首先，旋转计算部72求出连接左右内眼角标准位置的线段和连接左右内眼角当前位置的线段所形成的角度e，计算一e作为图像的旋转角度(S173)。  First, the rotation calculation unit 72 obtains a line segment connecting the left and right corner angle of the corner of the standard position and the current position of the line e is formed by connecting the right and left, a e is calculated as the rotation angle of the image (S173). 将连接左右内眼角标准位置的线段和坐标的X轴形成的角度设为0 s，将连接左右内眼角当前位置的线段和坐标的X轴形成的角度设为0P，旋转计算部72能够按照下面的式2所示求出0和一0。 The angle of the X-axis and the line segment connecting the left and right corner coordinates in the standard position is formed is set to 0 s, the angle of the inner corner of left and right connecting segments and coordinates of the current position of the X axis is formed to 0P, rotation calculation unit 72 can follow 0 and 10 is obtained as shown in formula 2. 其中，设左眼内眼角标准位置为(xls，yls)，设右眼内眼角标准位置为(xrs，yrs),设左眼内眼角当前位置为(xlp, yip),设右眼内眼角当前位置为(xrp, yrp)。  wherein the standard set left corner position (xls, yls), disposed within the standard position of right corner (xrs, yrs), disposed within the left corner of the current position (xlp, yip), provided the right-eye current position of the inner corner (xrp, yrp). 然后，平行移动计算部75求出以图16 (b)的右眼内眼角标准位置为始点、以右眼内眼角当前位置为终点的移动向量D，将向量一D设为图像的移动向量(S174)。  Then, the parallel movement calculation unit 75 obtains the right in FIG. 16 (b) in the standard position as a starting point corner to the right corner and ending at the current position of the motion vector D, and a vector image is set to D motion vector (S174). 该移动向量D用下面的式3表示。 The motion vector D 3 represented by the following formula. 然后，旋转处理部74使在图像存储部73中存储的正在视听的影像中所包含的左右图像旋转在S173求出的一0(S175)。  Then, the processing unit 74 so that rotation of the left and right images stored in the image storage unit 73 is viewed in the image contained in the S173 is obtained a rotation of 0 (S175). 按照下面的式4所示的变换矩阵进行各点的坐标的变换。 Transforming the coordinates of each point according to the transformation matrix shown in Formula 4 below. 然后，平行移动处理部76使在S175进行旋转后的左右图像移动一D (S176)。  Then, the parallel movement processing section 76 for rotational movement about an image D (S176) in S175. 对X坐标加上(一xrp + xrs)、对y坐标加上(一yrp + yrs),由此进行各点的坐标的移动。 Adding to the X-coordinate (a xrp + xrs), of the y coordinate by adding (a yrp + yrs), thereby moving the coordinates of each point. 如上所述，本实施方式的HMDl具有用于决定视听者的眼睛和显示器80的初始位置，并检测该位置的偏差的摄像机10和眼球位置校准部40和位置偏差检测部60和图像处理部70，将最初佩戴HMD并观察没有显示的暗的显示器80时的瞳孔位置和内眼角位置存储为标准位置，在视听影像的过程中逐次检测内眼角的位置相对于标准位置的偏差。  As described above, HMDl embodiment according to the present embodiment has the eye 10 and the position calibration unit determines an initial position of the viewer's eyes and the display 80, and detects the deviation of the position of the camera 40 and the position deviation detection section 60 and the image processing unit 70, and the HMD worn initially observed a dark display does not show the pupil position 80 and the inner corner position is stored as a standard position sequentially detected during viewing of the inside corner in the image relative to the position deviation of the standard position. 在内眼角的位置偏离标准位置的情况下，进行用于补偿内眼角的偏差的图像提示位置和角度的变换来进行显示。 If the position of the inner corner from the standard position, suggesting transformed position and angle of the corner to compensate for deviations in the image for display. 在这样进行动作的HMDl中，通过在观察没有任何显示的暗的显示器80的状态下确定瞳孔的位置，能够确定观察无限远处时的瞳孔位置，并决定图像显示的中心。 In such HMDl operates by observing the display without any dark display in a state to determine the position of the pupil 80 can be determined while observing the pupil position of infinity, and determines the center of the image display. 另外，在本实施方式的HMDl中，通过以在欣赏影像时也不移动的内眼角的位置为基准来补偿由于HMD的佩戴位置偏差而形成的显示器80和眼睛的位置偏差，能够显示针对左右眼睛不存在上下方向的偏差的准确视差的图像。  Further, in the present embodiment HMDl embodiment, since the display to compensate for misalignment of the HMD wearer formed by the position does not move the image while listening to the inner corner 80 as a reference and a positional deviation of the eye, can be displayed images for left and right eyes of the deviation in the vertical direction is not present accurate parallax. 由此，能够降低视听三维影像时的立体视的异常、或由于视听三维影像而形成的不协调感、疲劳、不舒适感。 Thereby, it is possible to reduce abnormal when viewing the stereoscopic three-dimensional image, or three-dimensional image is formed due to the viewing sense of discomfort, fatigue, and discomfort. 另外，通过在观察没有任何显示的暗的显示器80的状态下独立地确定左右瞳孔的位置，能够降低斜视等左右眼球的朝向存在偏差的视听者的疲劳。 Further, by observing the dark without any display position of the display to determine the state of the right and left pupils 80 independently, it is possible to reduce eye fatigue about strabismus viewer orientation deviations. S卩，根据本实施方式的HMD1，即使是视听者的视线移动时，也能够根据不移动的内眼角或者外眼角与显示器80的相对位置，而且是与视线无关地校正眼睛与显示器80的相对位置的偏差，因而即使是HMDl的佩戴位置偏差时，也能够防止由于眼睛与显示器80的相对位置的偏差而造成的立体视的异常或疲劳和影像眩晕。  S Jie, according HMD1 present embodiment, even when the line of sight of the viewer's movement, it is possible according to the relative position does not move the inner corner or a outer corner of the display 80, and is corrected eyes and the monitor irrespective of the line of sight deviation of the relative position of 80, so that even when wearing HMDl positional deviation, it is possible to prevent abnormal or fatigue and dizziness stereoscopic image due to deviation of the relative position of the eyes and the display 80 caused. 另外，在本实施方式中，在刚刚开始视听后，在S121显示暗画面，在S122拍摄眼睛整体，在S123粗略地切取图像，从而在S124进行内眼角识别，在S126进行瞳孔识别的动作，但也可以是，当在S190视听结束时，将瞳孔标准位置和内眼角标准位置以及内眼角识别的适用模型存储在图17所示的非易失性存储器即标准位置蓄积部130中，在下一次开始视听时不进行基于暗画面显示的校准，而仅进行此前的标准位置的微调。  Further, in the present embodiment, immediately after starting viewing, dark display screen S121, shooting S122 whole eye, coarsely cut image in S123, thereby performing inner corner recognition at S124, for the pupil recognition at S126 of action, but may also be, when viewing the end of S190, the nonvolatile memory in the normal position of the pupil and the inner corner and the applicable standard model storage location identified in the inner corner 17 as shown in FIG accumulation portion 130 that is the standard position, not start the next calibration based on a dark screen displayed when viewing, but only to fine-tune the previous standard position. 在这种情况下，当在步骤S129将内眼角标准位置存储于标准位置存储部50中时，也将在步骤S127决定的瞳孔位置的坐标存储于标准位置存储部50中。 In this case, when the inner corner step S129 is stored in the standard position storage unit 50 in the standard position, and the coordinates of the pupil position determined at step S127 is stored in the storage unit 50 in the standard position. 标准位置蓄积部130将例如视听结束时的左右内眼角标准位置、左右瞳孔标准位置、在检测内眼角时使用的适用模型的ID、和视听结束时的日期，作为数据进行蓄积。 The standard position storage unit 130, for example, the right and left inner corner at the end of viewing the standard position, the standard position of the right and left pupils, the model ID is suitable for use in the detection of the eye, and the end date of viewing, as data accumulates. 也可以是，在下一次开始视听时调用最近的数据，此外在下一次开始视听时在显示器80显示所蓄积的日期，视听者根据所显示的日期选择自己的数据。 May be, the next call to start viewing the most recent data, in addition to viewing the next time in the start date display 80 displays the stored viewer data selected according to their date shown. 也可以是，假设在数据中输入蓄积用于识别视听者的个人ID，视听者本人利用个人ID选择数据。 It may be assumed that the input is accumulated for identifying the viewer's personal ID data, the viewer selection data himself using a personal ID. 另外，在下一次开始视听时，如果是此前没有使用过该HMD的视听者，则从输入部110进行输入，以便进行校准。 Further, when viewing from the next, if not previously used the HMD viewer, an input from the input unit 110, for the calibration. 关于标准位置的微调，例如按照图18所示进行被置于SllO开始视听后的步骤S220的微调。  For the standard position of the fine adjustment, for example, in FIG 18 is positioned fine adjustment step after the start of viewing SllO S220 of FIG. 步骤S220的微调是指如下的动作。 Step S220 refers to a trimming operation. 首先，利用摄像机10拍摄眼睛整体(S122)。  First, the camera 10 shooting overall eye (S122). 然后，眼球位置校准部40调出在标准位置蓄积部130中存储的此前刚使用时的瞳孔标准位置和内眼角标准位置及内眼角识别的适用模型(S221)。 Then, the eyeball position calibration unit 40 to call up the stored accumulation unit 130 at the standard position and the standard position of the pupil position of the corner and within the applicable standard model eye immediately previously identified when using (S221). 内眼角检测部30仅切取在S221调出的此前刚刚视听时的内眼角标准位置的周围区域(S223)。 Only the corner detecting section 30 cut out in the peripheral area of ​​the standard position when the inner corner of the viewing S221 had just called out (S223). 如图19所示，周围区域例如设为在X轴上距在S221调出的内眼角标准位置的X轴上的位置为±5mm的范围。 19, a surrounding area such as the position of the X-axis on the X axis is set in the transfer from the inner corner of the standard position S221 is a range of ± 5mm. 另外，内眼角检测部30根据与在S221调出的此前刚使用时的内眼角识别的适用模型的核对，在通过S223切取的此前刚使用时的内眼角标准位置的周围区域内进行内眼角的识别(S224)。  Further, the inner corner detecting section 30 matching applicable model inner corner recognized just when used in S221 recall previously, the inner peripheral region of corner standard position within the time just used by S223 cut previously performed identifying inner corner (S224). 然后，眼球位置校准部40决定在图像中识别出的内眼角的位置(S125)。  Then, the eyeball position calibration unit 40 determines the image recognized in the corner position (S125). 然后，眼球位置校准部40决定瞳孔位置(S227)。 Then, the calibration unit 40 determines the position of the eye pupil position (S227). 在此，瞳孔位置不是识别瞳孔，而是按照下面的步骤决定的。 Here, the position of the pupil of the pupil is not identified, but is determined according to the following steps. 首先，在S224根据在S221调出的此前刚使用时的内眼角标准位置进行识别，针对左右内眼角分别求出向在S125决定的内眼角位置的移动向量。 First, identified according to the standard position at the inner corner had just called out in S221 in S224, the right and left eyes, respectively for obtaining the motion vector into the corner position is determined in S125. 然后，按照针对左右内眼角分别求出的移动向量，对在S221调出的此前刚使用时的左右瞳孔位置的坐标进行变换，将变换后的坐标决定为左右眼睛各自的瞳孔的位置。 Then, for the right and left eyes, respectively, in accordance with the determined motion vectors, the coordinates of the position when the right and left pupils in S221 immediately after the transfer of the transform, the transformed coordinates is determined as the respective left and right eye pupil position. 以后与本实施方式相同地，眼球位置校准部40决定图像显示位置(S128)，标准位置存储部50存储在S125由眼球位置校准部40决定的左右内眼角位置(S129)。  After the same manner as the embodiment according to the present embodiment, the eyeball position calibration unit 40 determines the image display position (S128), the right and left corner position determined in S125 standard position storage unit 50 stores the eyeball position calibration unit 40 (S129). 另外，标准位置存储部50存储在S227由眼球位置校准部40决定的左右瞳孔的位置(S131)。 Further, the standard position storage unit 50 stores the position in the right and left pupils S227 eyeball position determined by the calibration unit 40 (S131). 由此，在HMDl的用户固定的情况下，如果在初次使用时进行了校准，则以后使用时的校准仅是微调，能够节省在开始视听时观察暗画面显示的功夫。 Accordingly, in the case where a fixed HMDl user, if calibration during the initial use, the subsequent calibration using only fine-tuned, it is possible to observe a dark save screen displayed at the start of viewing effort. 另外，也能够缩短校准的时间，能够缩短视听者从进行开始视听输入后到视听内容影像的时间。 Further, it is possible to shorten the calibration time can be shortened from the viewer after viewing start time is input to the image of the audiovisual content. 并且，在非易失性存储器中存储多个用户的此前刚使用时的信息。 And, immediately after the information using a plurality of users stored in the nonvolatile memory. 用户在开始视听时输入开始信号和指定用户的信号。 Start signal and the input signal of the user specified in the user at the start of viewing. 输入部例如是旋钮或开关、触摸屏等。 An input unit, for example, knobs or switches, a touch panel. 当在SllO开始视听时受理视听开始信号和确定用户的信号，并读出在S221所确定的用户的此前刚使用时的信息，由此也能够应对多个用户。 When viewing the start acceptance SllO user viewing start signal and the determining signal, and reads out the information determined at S221 the user has just previously used, whereby it is possible to cope with a plurality of users. 另外，在本实施方式中，在S172，在左右两侧的显示器显示左眼用图像，由此将三维影像切换为二维影像，但也可以在双方显示器中显示右眼用图像。  Further, in the present embodiment, in S172, the display displays the left eye in the left and right sides of the image, whereby the three-dimensional video is switched to the two-dimensional image, may be displayed in both the right-eye image display. 另外，也可以是，在两侧的显示器中显示瞳孔的位置与显示器的中心位置的距离较短者的图像，由此将三维影像切换为二维影像。 Further, it may be that the shorter the image distance of the center position of the display position of the pupil displayed on the display on both sides, whereby the three-dimensional video is switched to the two-dimensional image. 例如，按照表示图9的S170的具体步骤的另一个流程图(图20)所示，当在S173计算旋转角度和在S174计算移动向量后，判定内眼角位置的偏差量是否超过基准值(S271)。  For example, according to another specific step S170 of the flowchart representation of FIG. 9 (FIG. 20), when calculating the amount of deviation in the rotational angle S173 and S174 in the motion vector calculation, it is determined whether the corner position exceeds a reference value (S271). 在其结果是偏差量为基准值以上的情况下、即在S271为否的情况下，左右图像控制部77根据在S173和S174决定的旋转Θ和平行移动D，对在标准位置存储部50中存储的左右瞳孔标准位置的坐标进行变换，求出当前的在观察无限远处时的瞳孔的位置。 In a result, the amount of deviation is greater than the reference value, i.e., at S271 is NO, the left and right image control unit 77 in S173 and S174 decide a rotation Θ and parallel movement D, 50 standard position storage unit storing the coordinates of the pupil about the standard position is transformed, obtains the current position of the pupil when viewed at infinity. 另外，左右图像控制部77求出:瞳孔标准位置的变换坐标即当前的在观察无限远处时的瞳孔的位置与当前的显示器中心的距离(S272)。 Further, the control unit 77 obtains the image left: standard pupil transformed coordinate position, i.e. the current position of the pupil when viewed at infinity with the current from the center of the display (S272). 基准值例如设为两眼的偏差量的合计值即6.5mm。 The reference value is set, for example, two of the shift amount that is the total value of 6.5mm. 在生成三维影像时通常使用的左右瞳孔间的距离为6.5cm, 6.5mm是其10%。 Right and left pupillary distance in generating three-dimensional image is generally used 6.5cm, 6.5mm is 10% thereof. 左右图像控制部77针对左右显示器将在S272求出的距离进行比较(S273)。 Right image control unit 77 compares the distance calculated for the left and right displays S272 (S273). 在右侧的瞳孔与显示器的距离大于左侧的情况下、即在S273为是的情况下，左右图像控制部77将左眼用图像替换为右眼用图像(S274)。 In the case where the display of the right pupil distance is greater than the left side, i.e. in the case where S273 is YES, the left and right eye image control unit 77 is replaced with the image of the right-eye image (S274). 即，将左眼用图像用作右眼用图像，对左右两眼提示左眼用图像。 That is, as the left-eye image for the right eye image, the left and right eye image two tips. 当在S273左侧的瞳孔与显示器的距离大于右侧的情况下、即在S273为否的情况下，左右图像控制部77将右眼用图像替换为左眼用图像(S275)。 In the case where the distance from the pupil of the display to the right of S273 is greater than the left, i.e. in case of NO in S273, the control unit 77 left and right images to the right eye image is replaced with a left eye image (S275). 即，对左右两眼提示右眼用图像。 That is, the tips of the left and right eyes right eye image. 这样，在二维化处理中，图像处理部70针对由位置偏差检测部60检测出的对于视听者的左眼和右眼各自的位置偏差中偏差量较大的眼睛用的图像进行图像处理。 Thus, the two-dimensional processing, the image processing unit 70 performs image processing for the respective position deviation of the deviation amount for the viewer's left and right eyes detected by the position deviation detecting section 60 with a larger image of the eye. 由此，在将三维影像切换为二维影像时，能够显示适合于更容易观察影像的状态的眼睛的二维影像。  Accordingly, when the three-dimensional video is switched to the two-dimensional image, two-dimensional image can be displayed more easily adapted to observe the state of the image of the eye. 在进行该处理的情况下，当在S120进行校准时，标准位置存储部50不仅存储由S125决定的内眼角标准位置，而且也存储由S127决定的瞳孔标准位置。 When performing this process, when the calibration At S120, the standard position storage unit 50 stores not only determined by the S125 standard inner corner position, but also the storage position determined by standard pupil S127. 另外，在本实施方式中，针对在S171进行校准时的眼睛与显示器80的相对位置，判定当前的眼睛与显示器80的相对位置的偏差量是否为基准值以上，并决定是进行三维图像显示用的校正还是进行从三维影像向二维影像的切换，但也可以是，不根据偏差量进行判定，而是由旋转计算部72求出将偏差分解为旋转和移动时的旋转角，在旋转角的角度为预先设定的基准值以上的情况下，进行从三维影像向二维影像的切换。  Further, in the present embodiment, for the relative position of the eyes and the monitor when calibration is performed in S171 80 determines the current eyes and the monitor deviation amount relative position 80 if less than a reference value, and determines a three-dimensional correcting for image display or to switch from a two-dimensional image of the three-dimensional image, but may not be determined according to the deviation amount, but by the rotation calculation unit 72 obtains the deviation into rotational movement and the rotation angle, value than the case where the reference angle is the rotation angle set in advance, switching from two-dimensional to three-dimensional video image. S卩，也可以是，图像处理部70将由位置偏差检测部60检测出的位置偏差分解为旋转和向水平方向及垂直方向的移动，在所分解的旋转的角度超过预先设定的值的情况下，进行用于将左眼用和右眼用的图像中任意一方作为左右两眼用的图像显示于显示器80的图像处理，而在所分解的旋转的角度未超过预先设定的值的情况下，进行使左眼用和右眼用的图像分别旋转的处理、以及使左眼用和右眼用的图像沿水平方向及垂直方向移动的处理。  S Jie, it may be that the position 60 detected by the image processing unit 70 the position deviation detecting portion and into rotational movement of the deviation in the horizontal direction and the vertical direction, the rotating angle of the decomposed exceeds a preset when the value is performed for the left eye and the right eye image as either one of left and right eyes of the image is displayed on the display 80 of the image processing, and the angle of rotation is not decomposed exceeds a preset when the value of the processing for the left-eye and right-eye images are respectively rotated by, and the left-eye and the image processing in the horizontal direction and the vertical direction with right-eye movement. 例如，按照表示图9的S170的具体步骤的另一个流程图(图21)所示，不根据偏差量进行判定，而是首先由旋转计算部72求出图16 (b)所示的旋转角Θ (S173)，判定部71将该旋转角Θ和预先设定的值例如6度进行比较(S371)。  For example, according to another specific step S170 of the flowchart representation of FIG. 9 (FIG. 21), the determination is not performed on the deviation, but is first calculated by the rotation calculation unit 72 in FIG. 16 (b) shown in FIG. rotation angle Θ (S173), determination unit 71 and the rotational angle [Theta] values ​​set in advance, for example, 6 degrees compared (S371). 在旋转角Θ为6度以上的情况下、即在S371为否的情况下，左右图像控制部77将左眼用图像替换为右眼用图像，将三维图像切换为二维图像(S172)。 In the case where the rotational angle Θ of less than 6 degrees, i.e., the case of NO, the control unit 77 left and right images to the left-eye image is replaced with the right-eye image, the three-dimensional image is switched to the two-dimensional image (S172) in S371. 关于将三维图像切换为二维图像的方法，也可以是将右眼用图像替换为左眼图像。 The three-dimensional image on a two-dimensional image switching method, may be replaced by the right-eye image using the left-eye image. 另外，也可以进行前述的S272〜S275的动作。 Further, the above-described operation may be performed to S272~S275. 另一方面，当在S371旋转角Θ小于6度的情况下、即在S371为是的情况下，与本实施方式相同地，通过进行S174〜S176的动作来计算移动向量，并进行图像的旋转和平行移动。 On the other hand, in a case where the rotation angle [Theta] S371 is less than 6 degrees, i.e., S371 is YES, similarly to the present embodiment, motion vector is calculated by performing the operation S174~S176, and the rotation of the image and parallel movement. 由此，在HMDl的佩戴偏差中，纵向偏差图像成为立体视的障碍，而作为纵向偏差图像的原因的旋转的成分过大的情况下，能够切换为二维影像。 Accordingly, the deviation HMDl worn, the longitudinal deviation of the stereoscopic image of an obstacle, as the rotating component causes a deviation of the longitudinal image is too large, two-dimensional image can be switched. 即，通过仅对容易产生立体视的异常或疲劳或者影像眩晕的偏差来切换为二维影像，能够防止不必要地妨碍三维影像的视听的情况。 That is, only the abnormal or prone to fatigue or motion sickness variation stereoscopic switched by a two-dimensional image can be prevented from unnecessarily hamper viewing of three-dimensional video. 另外，在本实施方式中说明了在S151—定拍摄内眼角，但是在HMDl的佩戴位置极端偏差的情况下，存在内眼角偏离摄像机10的摄像范围的情况。  Further, in the present embodiment is described in the embodiment given shooting S151- inner corner, but in the case of extreme HMDl wearing position deviation, deviation exists inside corner of the imaging range of the camera 10. 在这种情况下，也可以将左右任意一方的图像提示给左右两侧的显示器80，并切换为二维影像。 In this case, the left and right images may be presented to either one of the left and right sides of the display 80, and is switched to the two-dimensional image. 由此，即使是在HMDl的佩戴位置大大偏差而不能准确形成用于视听三维影像的视差的情况下，视听者也能够不勉强地继续影像的视听。 Accordingly, even in the wearing position HMDl greatly deviation can not accurately be formed for the case of three-dimensional video viewing disparity, the viewer can be forced to continue without viewing images. 另外，在本实施方式中，在视听影像内容的过程中逐次执行S140〜S180的动作，并随时对HMDl的佩戴位置的偏差进行图像处理，但也可以是，仅在一定的偏差持续达一定的时间以上的情况下进行图像处理。  Further, in the present embodiment sequentially performed while viewing the video content in operation S140~S180 and to keep wearing position deviation HMDl performs image processing, but may be continued only at a certain bias the image processing performed in the case of more than a certain time. 所谓一定的偏差是指偏差在有变动的范围内视为一定的情况。 The so-called certain deviation is regarded as a certain deviation is within the scope of change. 例如，如果偏差的变动处于在S160视为允许范围内的范围中，则视为一定的偏差。 For example, if the variation in the deviation considered allowable range in S160 in the range, a certain deviation is considered. 在本实施方式中，将S160的允许范围设为两眼的偏差之和在2mm以内。 In the present embodiment, it will allow the range to S160 deviations within two and 2mm. 例如，在两眼的偏差之和的时间变动在2mm以内的情况下，视为一定的偏差。 For example, in deviation and the time variation of the two in the case of less than 2mm, regarded as a certain deviation. 另外，所谓一定的时间例如指I秒钟。 Further, the term refers to a certain time, for example, I second. 所谓视听者在HMDl的佩戴位置偏差的状态下继续视听，可以考虑视听者没有注意到佩戴位置偏差的情况。 The so-called viewer to continue viewing at HMDl wearing position deviation state, consider wearing viewers did not notice the position deviation. 将注意到偏差到新佩戴设为约I秒钟，假设在一定的偏差保持了I秒钟以上的情况下进行S170的校正处理。 It will be noted about the deviation to the new set I wearing seconds, assuming a certain bias maintained under I above seconds case where the correction processing of S170. 由此，能够防止由于对视听者马上修正的佩戴偏差或HMD的暂时摆动实施图像处理而成为具有不协调感的显示。 Accordingly, the viewer can be prevented immediately correcting deviations or wearing the HMD image processing temporarily swing becomes exhibit a sense of discomfort. 另外，不需要逐次的图像处理，能够削减处理量。 In addition, no sequential image processing, the processing amount can be reduced. 并且，在偏差非一定的状态持续达一定时间以上的情况下，将左右任意一方的图像提示给左右两侧的显示器，并切换为二维影像。 And a case where, in a state of non deviation continues for more than a certain predetermined time, the left image is presented to either one of the left and right sides of the display, and switched to the two-dimensional image. 所谓偏差非一定的状态是指视听者的头部剧烈运动的情况。 The so-called non-constant offset refers to a state where the head of the viewer is intense exercise. 即，视听者在进行步行等运动、或者有可能被传递了交通工具等的振动。 That is, the viewer during exercise such as walking, there is likely to be transmitted or vehicle vibration or the like. 这种头部剧烈运动的状态是容易产生影像眩晕的状态，因而在偏差非一定的情况下切换为二维影像，由此能够防止视听者的影像眩晕。 This state of the head is prone to strenuous exercise state of motion sickness, and therefore deviation in a non-constant switching to the two-dimensional image, thereby preventing motion sickness viewer. 关于偏差非一定的状态持续的时间，例如设为5分钟。 Continuing non-constant time offset state, for example, set to 5 minutes. 另外，在本实施方式中，将内眼角的位置作为指标来检测显示器80与眼睛的相对位置的偏差，但只要是在视听影像时位置不变的眼睛的周围部位，则也可以是外眼角等内眼角以外的部位。  Further, in the present embodiment, the position of the inner corner 80 as an index to detect the deviation of the display of the relative position of the eye, but as long as the area around the same position when viewing the image of the eye, it may be the inner corner portions other than the outer corner of the eye and the like. 下面，说明本发明的实施方式2的头戴式显示器及其位置偏差调整方法。  Next, embodiments of the present invention, a head-mounted display and a method of adjusting a position deviation of 2. 在实施方式I中，说明了无论HMDl的形状如何，在HMDl偏离眼球前方的情况下，计算该偏差的向量的方法。  In the embodiments of formula I, regardless of the shape described HMDl is, in a case where the front HMDl departing from the eye, the method of the deviation vector calculation. 但是，通常HMDl往往是被视听者的鼻子的凸部分支撑着。 However, usually the convex portions are often HMDl nose viewer supported. 图22是表示本实施方式的HMDl的硬件结构的一例的图。 FIG 22 is a diagram illustrating an example of a hardware configuration of the present embodiment HMDl embodiment. 在视听者的左眼前方设置左眼用显示器80L，在视听者的右眼前方设置右眼用显示器80R。 In front of the viewer's left eye with the left-eye display set 80L, 80R disposed in the right-eye display in front of the right eye of the viewer. 在两个显示器之间设置用于拍摄视听者的眼睛的摄像机10。 Between two display settings for capturing viewer eye camera 10. 对于红外线摄像机，将红外线的发光部与摄像机10相邻设置。 For infrared camera, an infrared light emitting portion 10 and disposed adjacent to the camera. 设置眼镜腿和鼻垫，以便佩戴并固定HMDl。 Set the temple and nose pads for wear and fixed HMDl. HMDl的支点是两耳和鼻子，支撑中心位置的是鼻子，因此在HMDl倾斜的情况下，即在相对于表示正常时的HMDl的佩戴状态的图23 (a), HMDl如图23 (b)所示向右下方偏差的情况下，HMDl往往以Pa为支点而倾斜。 HMDl the pivot ears and nose, the nose is the center position of the support, thus in the case HMDl inclined, i.e. with respect to the wearing state during normal HMDl represented in FIG. 23 (a), HMDl FIG. 23 (b) deviation in the case shown to the right, HMDl Pa often inclined as a fulcrum. 相反，在如图23(c)所示向左下方偏差的情况下，往往以Pb为支点而偏差。 In contrast, in the case of deviation to the left in FIG. 23 (c), the Pb often deviation as a fulcrum. 在以这些支点Pa和Pb为中心而偏差的情况下，能够利用较少的图像特征量检测HMDl的偏差。 Under these fulcrums Pa and Pb and the deviation of the center of the case, with less deviation detecting image feature amount of HMDl. S卩，在本实施方式中，关于待检测的位置偏差，位置偏差检测部60检测由于头戴式显示器I以视听者的鼻子为支点进行旋转而形成的位置偏差，而且假设头戴式显示器I的右侧降低的旋转是以视听者的鼻子的右侧的凸面的一点为中心的旋转，头戴式显示器I的左侧降低的旋转是以视听者的鼻子的左侧的凸面的一点为中心的旋转，如此检测位置偏差。  S Jie, in the present embodiment, the positional deviation detected to be on, the positional deviation detecting unit 60 detects the positional deviation due to the head-mounted display I viewer's nose is formed by a fulcrum, and assuming wearing right rotary display I decrease is based on the center point of a convex surface of rotation of the right side of the viewer's nose, the left side of the head-mounted display I reduced rotation is convex on the left side of the viewer's nose point as the center of rotation, thus detecting the positional deviation. 更具体地讲，关于位置偏差，位置偏差检测部60使用从视听者的鼻子的凸面的一部分即支点到摄像机10位置的相对位置，计算头戴式显示器I的旋转量，由此检测位置偏差。  More specifically, regarding the position deviation, the position deviation detecting unit 60 uses a relative position from the fulcrum portion that is convex to the viewer nose position of the camera 10 calculates an amount of rotation of the head-mounted display I, thereby detecting position deviation. 此时，位置偏差检测部60使用与摄像机10拍摄的图像的中心较近的内眼角或者外眼角的位置作为标准位置来检测位置偏差。 In this case, the position deviation detecting unit 60 uses the center of the camera 10 and the image taken position close to the inner or outer corner of the corner position as the standard to detect positional deviation. 下面，关于本实施方式的位置偏差的检测方法即计算HMDl倾斜的角度的方法，使用图24进行具体说明。 Method  Next, a method for detecting positional deviation with respect to the present embodiment, i.e., the inclination angle calculated HMDl, 24 will be specifically described with reference to FIG. 图24中的点Xs是在实施方式I的步骤S120通过校准而决定的标准内眼角位置。 Xs point in FIG. 24 is a standard in the embodiments of formula I is determined in step S120 by calibration corner position. 在本实施方式中，不将原点设定在左右摄像机10之间，而是设定在右眼用摄像机的左上端(点Os)。 In the present embodiment, the origin is not set between the right and left camera 10, but with the upper left corner is set in the right-eye camera (point Os). 在图24 (a)所示的状态下，以鼻子的点Pa的点为支点来支撑HMD1，从拍摄视听者的眼球的摄像机，检测内眼角相对于原点Os的位置，并作为Xs (xrs,yrs)的坐标值。 In the state shown in (a) in FIG. 24, a point Pa of the point of the nose as a fulcrum to support the HMD 1, the viewer eye imaging camera, the position of the origin with respect to the detected corner Os, and as Xs (xrs, YRS) coordinate values. 此时，以点Pa为支点，HMDl按照图24 (b)所示以倾斜角Θ进行倾斜。 In this case, as a fulcrum point Pa, HMDl (b) at an inclination angle Θ as shown in FIG 24 is inclined. 此时，摄像机的原点Os也偏差到相对于基准坐标系(不依赖于摄像机、眼球的位置的基准坐标系)倾斜了Θ的位置。 At this time, the origin of the camera is also offset to Os (reference coordinate system does not depend on the camera, the eye position) inclined with respect to a reference coordinate system of the position Θ. 其结果是，相对于基准坐标系，原点Os以Pa为中心而旋转到原点O' S，并且点Xs的坐标也以Pa为中心而旋转到VS。 As a result, with respect to the reference coordinate system, the origin of the center Os is rotated in Pa to the origin O 'S, and Xs are also coordinate point as a center of rotation Pa to VS. 即，如果将旋转坐标变换矩阵设为R，则得到0183] 另外，在图24 (a)中，在基准坐标系中，将点Os相对于点Pa的向量设为(Χ0，Υ0)。 That is, if the rotational coordinate transformation matrix is ​​set to R, to give the 0183] Further, in FIG. 24 (a), in the reference coordinate system, with the point Os of the vector to the point Pa (Χ0, Υ0). 即，支撑HMDl的鼻子的位置与摄像机10拍摄的原点的坐标的相对位置关系是通过设计时的测量等被预先赋予的。 That is, the relative positional relationship between the coordinate position of the support nose HMDl imaging camera 10 with the origin is determined by measuring the like designed to be given in advance. 此时，在基准坐标系中，点Xs相对于点Pa的位置向量(坐标值)能够利用下式计算出。 In this case, in the reference coordinate system, relative position vector points Xs point Pa (coordinate values) that can be calculated using the formula. 0187] 另一方面，计算HMDl仅倾斜Θ时的状态下的点Xs的位置坐标。 0187] On the other hand, the position Xs coordinate point in a state when a tilt Θ calculating HMDl only. 在图24 (b)所示的状态下，在基准坐标系中，点Xs相对于点Pa的位置向量(坐标值)能够利用旋转后的点O' s的位置表述如下式。 In the state shown in (b) in FIG. 24, in the reference coordinate system, relative position vector points Xs point Pa (coordinate values) can be rotated using the position of the point O 's representation of the following formula. 在此，在基准坐标系中，假设内眼角的位置是固定的，则下述的两个式子(式11、式12)成立。  Here, in the reference coordinate system, the position of the inner corner of the eye are assumed fixed, the following two formulas (Formula 11, Formula 12) is established. 在此,点Os相对于鼻子的支点坐标Pa的位置坐标(XO, YO)当被假设为在设计时视听者的鼻子所在的位置时，则是被预先赋予的值。  Here, the position coordinates of the point with respect to the fulcrum Os Pa nose coordinates (XO, YO) when the position assumed in the design where the viewer's nose, the value is given in advance. 另外，根据拍摄眼球的摄像机10，在如图24 Ca)所示的状态下的内眼角的坐标值被赋予了(xrs，yrs), HMDl以点Pa为支点而倾斜的图24 (b)所示状态下的内眼角的坐标值被赋予了(xrp，yrp)时，能够计算出HMDl的倾斜角Θ。 Further, according to the camera 10 photographing the eye, the inner corner coordinate values ​​in shown in FIG. 24 Ca) in a given state (xrs, yrs), HMDl to tilt as a fulcrum point Pa in FIG. 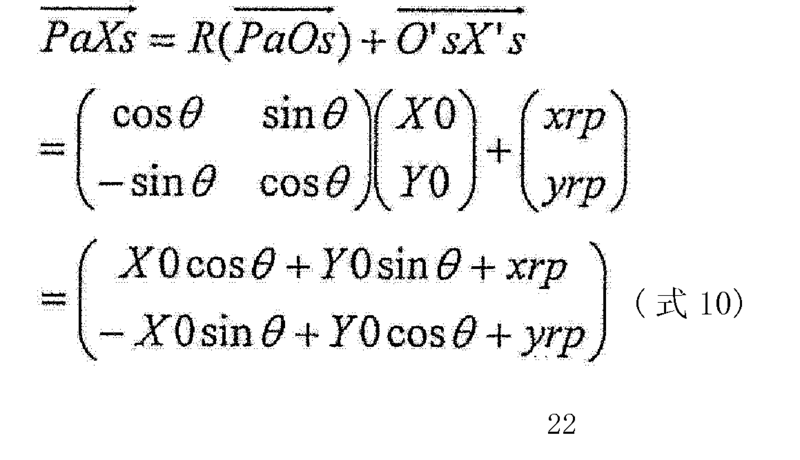 24 (b) is when the coordinate values ​​of the inner corner of the state diagram is given (xrp, yrp), it can be calculated the angle of inclination Θ HMDl. 在上述的两个式子(式11、式12)中，能够根据各式计算倾斜角Θ。  In the above two formulas (Formula 11, Formula 12), the inclination angle Θ can be calculated according to various types. 但是，在根据内眼角的位置来测定以点Pa为中心的旋转方向的偏差的情况下，内眼角与支点的位置关系是y轴方向的偏差大于X轴方向的偏差。 However, in the case where the deviation is measured in the direction of rotation as the center point Pa in accordance with the position of the inner corner of the eye, inner corner of the positional relationship between the fulcrum and the y-axis direction of the deviation is larger than the X-axis direction of the deviation. 因此，在如图24 (b)所示旋转了Θ时，水平方向的偏差量增大。 Thus, in FIG. 24 (b) upon rotation of Θ, the deviation amount in the horizontal direction is increased. 因此，测量式11中的xrs和xrp来计算Θ的值，其精度将更好。 Therefore, the measurement of Formula 11 xrs xrp and Θ calculated values, which will be better accuracy. 另外，在图24所示的例子中，根据头戴式显示器的一侧向下方降低来计算出偏差量，但在相反的情况下，能够设为以Pb为支点的旋转来进行计算。  Further, in the example shown in FIG. 24, downwardly lowered side head-mounted display according to the calculated deviation amount, but in the opposite case, Pb is set as a fulcrum of rotation to be calculated . 另外，在图24所示的例子中，在HMD`l向右侧倾斜时，使用右眼的内眼角的位置求出旋转角。  Further, in the example shown in FIG. 24, when the HMD`l inclined to the right, the position of the inner corner of the eye using the determined rotation angle. 但是，在不能取得清晰的内眼角的图像、或内眼角的位置偏离出摄像机10的视场角时，也能够使用左眼的内眼角的位置计算旋转量。 However, when a clear image can not be obtained within the eye, or a position offset from the inner corner of the viewing angle of the camera 10, it is possible to calculate the position of the rotational amount of the inner corner of the eye. 但是，旋转中心需要使用以相同的点Pa为旋转中心的计算方法。 However, the rotation center calculation method requires the use of the same center of rotation as the point Pa.
 另外，在上述的计算中，不考虑基于摄像机10的透镜的畸变而进行计算。  In the above calculation, calculation is performed without considering lens distortion based camera 10. 通常，利用摄像机拍摄的图像在所拍摄的图像越远尚中心时(越接近周围部分时)，越广生崎变。 (When closer surrounding section) In general, an image captured by the camera in the center of the image farther still taken, the more Guangsheng of distortion. 因此，在根据利用摄像机10拍摄的图像计算HMDl倾斜的量时，在使用内眼角或者外眼角的情况下，尽量将在摄像机10的中心拍摄到的对象作为基准，这样精度将更好。 Thus, when the calculated inclination amount HMDl image captured by the camera 10, in the case where the inner or outer corner of the eye, as far as possible in the center of the camera to the photographed object 10 as a reference, so the accuracy will be better. 因此，使用内眼角或者外眼角这两者中接近拍摄中心的对象来检测倾斜量，能够高精度地进行计算。 Therefore, near the outer corner of the corner or the center of the object captured in both the amount of tilt detected, it can be calculated with high accuracy. 另外，在实施方式I和2中，检测视听者的内眼角，并对应内眼角的位置的偏差来校正图像的显示位置，但也可以检测外眼角，并对应外眼角的位置的偏差来校正图像的显示位置。  Further, in the embodiments I and 2, the inner canthus detection viewer, and a corresponding variation of a position within the eye to correct the image display position, it may detect the outer corners, and corresponding to the deviation position of the outer corner displaying the image position correction. 在图22所示的例子中，将摄像机10设于左右显示器之间，即在进行拍摄的各个内眼角侧设置摄像机，但在检测外眼角的情况下，也可以将左右摄像机10设置在HMDl的眼镜腿侧即进行拍摄的各个外眼角侧。 In the example shown in FIG. 22, the camera 10 is provided between the left and right displays, each of the inner corner side is performed i.e. the camera shooting, but in the case of detecting the outer corner, the camera 10 may be disposed about the HMDl the temple side of each outer corner of the eye that is photographed side. 此时，内眼角检测部30成为外眼角检测部，并具有外眼角识别用模型而非内眼角识别用模型。 In this case, the corner detecting section 30 is an outer corner detecting section, and has an outer corner of the eye and not the inner corner model identification recognition model. 标准位置存储部50存储外眼角标准位置而非内眼角标准位置。 Standard position storage unit 50 stores the standard position within the outer corner corner rather than the standard position. 由此，能够对应外眼角的位置的偏差来校正图像的显示位置。 Thus, variation of a position corresponding to an outer corner of the image display position is corrected. 以上，关于本发明的头戴式显示器I及其位置偏差调整方法，使用实施方式I和2进行了说明，但本发明不限于这些实施方式。  or more, and its location on the head-mounted display I bias adjustment method of the present invention, using embodiments of formula I and 2 have been described, but the present invention is not limited to these embodiments. 在不脱离本发明宗旨的范围内对各实施方式实施本行业人员能够想到的各种变形而得到的方式、或将各实施方式及变形例中的构成要素进行任意组合而得到的方式，均包含在本发明中。 Forms without departing from the spirit of the present invention, the scope of various embodiments of the present modification industry personnel occur to each embodiment is obtained, or the respective embodiments and structural elements in any combination modification obtained in a manner, contains in the present invention. 例如，也可以利用半导体集成电路即LSI来实现上述块图(图5、图7)中的处理系统的功能单元。  For example, an LSI may be realized in the above-described functional units of the processing system block diagram (FIG. 5, FIG. 7) in the semiconductor integrated circuit. 该LSI可以按照每个功能单元而形成为单片，也可以形成为包含一部分或者全部的单片。 The LSI may be formed as a single piece for each functional unit may be formed as a single piece comprising a part or all. 另外，在此所谓LSI也包括根据集成度的不同而被称为1C、系统LS1、超级(super)LS1、特级(ultra)LSI 的情况。 Further, this also includes the so-called LSI depending on the integration degree is referred to 1C, the system LS1 is, super (super) LS1, special grade (Ultra) in the LSI. 另外，集成电路化的方法不限于LSI，也可以利用专用电路或者通用处理器实现。  Further, the method of circuit integration is not limited to LSI, and a dedicated circuit or a general-purpose processor. 也可以采用在制作LSI后能够编程的可现场编程门阵列(FPGA:Field Programmable GateArray)、能够重构架LSI内部的电路单元的连接和设定的可重构处理器(reconfigurableprocessor)。 May also be employed can be programmed after manufacturing LSI of the field programmable gate array (FPGA: Field Programmable GateArray), it can be re-connected to the frame and a reconfigurable processor settings of circuit cells inside the LSI (reconfigurableprocessor). 另外，上述实施方式中的头戴式显示器I如使用图8说明的那样，也可以利用计算机来实现，该计算机由微处理器、R0M、RAM、硬盘装置、显示器装置、键盘、鼠标等构成。  Further, the above-described embodiment is described as head-mounted display as I 8 is used, it may be realized by a computer, the computer microprocessor, R0M, RAM, a hard disk device, a display device, keyboard, mouse and the like. 在此，在RAM或者硬盘装置中存储有计算机程序。 Here, in the RAM or the hard disk unit stores a computer program. 微处理器按照该计算机程序进行动作，由此头戴式显示器I实现其功能。 The microprocessor operates according to the computer program, whereby the head-mounted display I fulfill its function. 在此，计算机程序为了实现预定的功能，可以组合多个表示对计算机的指令的命令代码而构成。 Here, the computer program to achieve predetermined functions, may be combined in a plurality of instruction codes instruct the computer to be configured. S卩，这种程序也可以是使计算机(或者处理器)调整在头戴式显示器中显示的三维影像的位置偏差的方法，使计算机执行以下步骤:显示步骤，在显示器中显示三维影像•'位置取得步骤，测量视听者的内眼角或者外眼角相对于所述显示器的位置；标准位置存储步骤，将用于决定与所述位置相关的标准位置的校准中由所述位置取得步骤测量出的所述内眼角或者所述外眼角的位置，作为所述标准位置存储到标准位置存储部中；位置偏差检测步骤，检测通过所述位置取得步骤新测量出的正在视听内容的所述视听者的所述内眼角或者所述外眼角相对于所述显示器的位置、与在所述标准位置存储部中存储的所述视听者的所述标准位置之差，作为位置偏差；以及图像处理步骤，在通过所述位置偏差检测步骤检测出位置偏差时，以使显示于所述显示器的三维影  S Jie, such that the program may be a computer (or processor) of the three-dimensional image position adjustment method shown in the variation of the head-mounted display, cause a computer to execute: a display step of displaying in the display a three-dimensional Imaging • 'position obtaining step of measuring the inner corner or a outer corner position relative to the viewer's display; standard position storage step, a calibration standard position associated with the position determined by the position acquired in step measured position of the inner or outer corner of the corner, is stored as a standard position to the standard position storage unit; positional deviation detection step of detecting a position by the step of obtaining said new audiovisual content being measured in the viewer or inner corner of the outer corner position relative to the display, the difference between the viewer and stored in the standard position of said standard position storage unit, a position error; and an image processing three fixing step, when the position deviation detected by the position deviation detection step, so that the display on the display 根据所述检测出的位置偏差而旋转或者平行移动的方式，对所述三维影像进行图像处理。 Rotated according to the detected positional deviation or parallel movement mode, the three-dimensional video image processing. 另外，构成上述实施方式中的头戴式显示器I的构成要素的一部分或者全部可以由能够插拔的IC卡或者单体模块构成。  Further, components constituting the above-described embodiment I of the head mounted display may be constituted by part or all of an IC card or plug can be a single module. IC卡或者模块是由微处理器、R0M、RAM等构成的计算机系统。 The IC card or module is a computer system including a microprocessor, R0M, RAM and the like. IC卡或者模块也可以包含超多功能LSI。 The IC card or module may include the super multifunctional LSI. 微处理器按照计算机程序进行动作，由此IC卡或者模块实现其功能。 The microprocessor operates according to the computer program, whereby the IC card or the module achieves its function. 该IC卡或者该模块可以具有反篡改性(耐夕>〃性)。 The IC card or the module may have an anti-tamper resistance (Xi> 〃 resistance). 另外，本发明也可以实现为上述实施方式中的流程图所示的方法。  Further, the present invention may also be implemented as a method flowchart of the above-described embodiment shown in FIG. 并且，也可以实现为利用计算机实现该方法的计算机程序，还可以实现为表示该计算机程序的数字信号。 And, may also be implemented using a computer program implementing the method, it may also be implemented as a computer program showing the digital signal. 并且，本发明也可以实现为将该计算机程序或者数字信号记录在计算机可以读取的记录介质中，所述记录介质例如是软盘、硬盘、⑶一ROM、MO、DVD、DVD 一ROM、DVD 一RAM、BD(Blu-ray Disc:蓝光盘)、半导体存储器等。 The present invention may also be implemented as a computer program or a recording medium the digital signal recorded on a computer readable medium, the recording medium such as a flexible disk, a hard disk, a ⑶ ROM, MO, DVD, DVD a ROM, DVD a RAM, BD (Blu-ray disc: Blu-ray disc), a semiconductor memory. 并且，本发明当然也可以构成为经由电气通信线路、无线或者有线通信线路、以因特网为代表的网络、数据广播等，传输所述计算机程序或者数字信号。  and, of course, the present invention may be configured via an electric communication line, a wireless or wired communication line, a network represented by the Internet, data broadcast, transmitting the computer program or the digital signal. 并且，本发明也可以构成为将所述计算机程序或者数字信号记录在记录介质中并传输，或者经由所述网络等传输所述计算机程序或者数字信号，从而能够利用独立的其他计算机系统来实施本发明的头戴式显示器或者其位置偏差调整方法。  Further, the present invention may be configured as the computer program or the digital signal recorded in a recording medium and transmitted, via a transmission or the computer program or the digital signal of the network or the like, it is possible to use another independent computer system embodiment of the present invention to the head-mounted display, or a positional deviation adjustment method. I头戴式显示器(HMD); 10摄像机；IOL摄像机(左眼用摄像机);IOR摄像机(右眼用摄像机)；20瞳孔检测部；30内眼角检测部；40眼球位置校准部；50标准位置存储部；60位置偏差检测部；70图像处理部；71判定部；72旋转计算部；73图像存储部；74旋转处理部；75平行移动计算部；76平行移动处理部；77左右图像控制部；80显示器；80L显示器(左眼用显示器)；80R显示器(右眼用显示器)；100位置取得部；110输入部；120图像存储/接收部；130标准位置蓄积部；211输入部；212存储部；213输出部；214CPU ;215R0M ;216RAM ;217输入输出I/F ；220计算机。  I a head mounted display (HMD); 10 camera; eyeball position calibration unit 40; the IOL cameras (left-eye camera); the IOR camera (right-eye camera); a pupil detecting section 20; an inner corner detecting section 30; 50 standard position storage unit; 60 a positional deviation detecting unit; 70 an image processing unit; 71 determination unit; 72 rotation calculation unit; 73 an image storage unit; 74 rotation processing unit; 75 parallel to the mobile computing unit; 76 a parallel movement processing unit; about 77 The image control unit; 80 a display; a display 80L (left-eye display); display 80R (right-eye display); position obtaining unit 100; an input unit 110; 120 image storing / receiving unit; the standard position storage unit 130; an input unit 211 ; storage unit 212; an output unit 213; 214CPU; 215R0M; 216RAM; 217 input-output I / F; 220 computer. 1.一种头戴式显示器，该头戴式显示器具有: 显示器，显示三维影像； 位置取得部，测量视听者的内眼角或者外眼角相对于所述显示器的位置； 标准位置存储部，将用于决定与所述位置相关的标准位置的校准中由所述位置取得部测量出的所述内眼角或者所述外眼角的位置，作为所述标准位置取得并存储； 位置偏差检测部，检测由所述位置取得部新测量出的正在视听内容的所述视听者的所述内眼角或者所述外眼角相对于所述显示器的位置、与在所述标准位置存储部中存储的所述视听者的所述标准位置之差，作为位置偏差；以及图像处理部，在由所述位置偏差检测部检测出位置偏差时，以使显示于所述显示器的三维影像根据所述检测出的位置偏差而旋转或者平行移动的方式，对所述三维影像进行图像处理。 A head-mounted display, the head-mounted display comprising: a display to display three-dimensional video; position acquisition unit, the measurement of the inner corner or viewer with respect to the outer corner of the display; standard position storage unit, with the at decision calibration position associated with the normal position of the position acquired by the position of the measured portion of the outer or inner corner of the eye, and the position acquired as a standard memory; positional deviation detecting section, is detected by the the viewer is viewing the contents of the newly measured position acquiring section or inner corner of the outer corner of the eye of the viewer position with respect to the display, and stored in the storage unit in the standard position the standard deviation of the positions, as a position deviation; and an image processing unit, when the position deviation detected by said positional deviation detecting section, to cause the display to display three-dimensional image based on the detected positional deviation and parallel movement or rotational manner, the three-dimensional video image processing. 2.根据权利要求1所述的头戴式显示器，所述位置取得部具有测量所述视听者的瞳孔与所述显示器的相对位置的传感器， 所述头戴式显示器还具有校准部，该校准部根据由所述传感器测量的在所述显示器不显示所述三维影像的状态下的所述相对位置，决定所述标准位置，并将所决定的标准位置存储在所述标准位置存储部中。 The head-mounted display according to claim 1, the position obtaining unit includes a sensor measuring the relative position of the pupil of the viewer of the display, the head-mounted display further includes a calibration portion, the calibration the measured by the sensor portion of the relative position of the state in which the three-dimensional image is not displayed on the display, determining the standard position, the standard position and the determined storage location of the storage unit in the standard. 3.根据权利要求1所述的头戴式显示器，所述图像处理部进行使构成所述三维影像的左眼用和右眼用的图像分别旋转的处理、以及使所述左眼用和所述右眼用的图像沿水平方向和垂直方向移动的处理。 The head-mounted display according to claim 1, the image processing unit processes constituting the left-eye three-dimensional video image and the right eye are rotated, and the left-eye and the said right-eye image in the horizontal direction and the vertical direction is performed. 4.根据权利要求1所述的头戴式显示器，所述图像处理部还进行用于将构成所述三维影像的左眼用和右眼用的图像中的任意一方作为左右两眼用的图像显示于所述显示器的图像处理。 The head-mounted display according to claim 1, wherein the image processing unit also for constituting the left-eye three-dimensional video by any one of the image and a right eye image as the left and right eyes of the image processing displayed on the display. 5.根据权利要求4所述的头戴式显示器，所述位置取得部对于所述视听者的左眼和右眼分别测量所述位置， 所述标准位置存储部对于所述视听者的左眼和右眼分别存储所述标准位置， 所述位置偏差检测部对于所述视听者的左眼和右眼分别检测所述位置偏差， 所述图像处理部对于由所述位置偏差检测部检测出的所述视听者的左眼和右眼各自的所述位置偏差中、偏差量较小的眼睛用的图像，进行所述图像处理。 The head-mounted display as claimed in claim 4, wherein the location acquisition unit to the viewer's left and right eyes, respectively, said measuring position, said standard position storage unit for the left eye of the viewer and storing said standard position right eye, the positional deviation detecting section to the viewer's left and right eyes of the positional deviation detection, the image processing unit to the position deviation detected by the detecting section out the deviation of the position of each of the viewer's left and right eyes, eyes with a small deviation of the image, performs the image processing. 6.根据权利要求1所述的头戴式显示器，在由所述位置偏差检测部检测出的位置偏差的量超过预先设定的值的情况下，所述图像处理部进行用于将构成所述三维影像的左眼用和右眼用的图像中的任意一方作为左右两眼用的图像显示于所述显示器的图像处理，在由所述位置偏差检测部检测出的位置偏差的量未超过预先设定的值的情况下，所述图像处理部进行使所述左眼用和所述右眼用的图像分别旋转的处理、以及使所述左眼用和所述右眼用的图像沿水平方向和垂直方向移动的处理。 6. The head-mounted display case according to claim 1, in an amount of positional deviation detected by said positional deviation detecting section exceeds a preset value, the image processing section for constituting any one of the left eye and right eye images of said three-dimensional image in a left and right eyes of the image is displayed on the display image processing, the amount of deviation detected by said positional deviation detecting section does not exceed a position if a value set in advance, the image processing unit processes the left-eye image and the right eye so that the rotation, respectively, and the left-eye image and the right eye along mobile handling the horizontal and vertical directions. 7.根据权利要求6所述的头戴式显示器，所述图像处理部将由所述位置偏差检测部检测出的位置偏差分解为旋转和向水平方向及垂直方向的移动，在所述旋转的角度超过预先设定的值的情况下，进行将所述左眼用和所述右眼用的图像中的任意一方作为左右两眼用的图像显示于所述显示器的图像处理，在所述旋转的角度未超过预先设定的值的情况下，进行使所述左眼用和所述右眼用的图像分别旋转的处理、以及使所述左眼用和所述右眼用的图像沿水平方向和垂直方向移动的处理。 7. The head mounted display according to claim 6, the positional deviation detected by the position image processing section into rotational deviation detecting unit and moved in the horizontal direction and the vertical direction, the rotation angle in the case exceeds a preset value, for the left-eye and right-eye image of any one of the left and right eyes as in the image processing of the image is displayed on a display, the rotating if the value does not exceed a predetermined angle, the processed left eye image and the right eye so that the rotation, respectively, and the left-eye and the right eye image in the horizontal direction and vertical movement process. 8.根据权利要求1所述的头戴式显示器，所述位置偏差检测部检测该头戴式显示器以所述视听者的鼻子为支点进行旋转而产生的位置偏差，作为所述位置偏差，而且，设该头戴式显示器的右侧降低的旋转是以所述视听者的鼻子右侧的凸面的一点为中心的旋转，设该头戴式显示器的左侧降低的旋转是以所述视听者的鼻子左侧的凸面的一点为中心的旋转，由此检测所述位置偏差。 The head-mounted display according to claim 1, the positional deviation detecting unit detects positional deviation of the head-mounted display to the viewer's nose as a fulcrum is generated as the positional deviation, and , is the center of rotation is the rotation of the convex surface of the right side of the viewer's right side of the head-mounted display is provided to reduce the nose, provided on the left side of the head-mounted display is reduced rotation of said viewer convex surface of the nose on the left side as the center point of the rotation, thereby detecting the positional deviation. 9.根据权利要求8所述的头戴式显示器，所述位置取得部具有拍摄所述内眼角的摄像机， 作为所述位置偏差，所述位置偏差检测部使用从作为所述视听者的鼻子的凸面的一部分的支点到所述摄像机的位置的相对位置来计算该头戴式显示器的旋转量，由此检测所述位置偏差。 9. The head-mounted display according to claim 8, the imaging position obtaining section of the inside corner having a camera, as the position deviation, the position deviation detecting unit using the nose from a viewer's convex surface portion of the fulcrum to the opposite position of the camera is calculated rotation amount of the head-mounted display, thereby detecting the positional deviation. 10.根据权利要求9所述的头戴式显示器，所述位置偏差检测部使用与利用所述摄像机拍摄的图像的中心较近的所述内眼角或者所述外眼角的位置作为所述标准位置，来检测所述位置偏差。 The closer the position of the outer or inner corner of the corner 10. The center of the image of the head-mounted display as claimed in claim 9, the positional deviation detecting unit using a video camera using the position as the standard , detecting the positional deviation. 11.一种头戴式显示器的位置偏差调整方法，用于调整在头戴式显示器中显示的三维影像的位置偏差，该位置偏差调整方法包括以下步骤: 显示步骤，在显示器中显示三维影像。 A head-mounted display position bias adjustment method for adjusting a positional deviation in the displayed three-dimensional image head-mounted display, the positional deviation adjustment method comprising the steps of: a display step of displaying the three-dimensional image display. 位置取得步骤，测量视听者的内眼角或者外眼角相对于所述显示器的位置； 标准位置存储步骤，将用于决定与所述位置相关的标准位置的校准中由所述位置取得步骤测量出的所述内眼角或者所述外眼角的位置，作为所述标准位置取得并存储到标准位置存储部中； 位置偏差检测步骤，检测通过所述位置取得步骤新测量出的正在视听内容的所述视听者的所述内眼角或者所述外眼角相对于所述显示器的位置、与在所述标准位置存储部中存储的所述视听者的所述标准位置之差，作为位置偏差；以及图像处理步骤，在通过所述位置偏差检测步骤检测出位置偏差时，以使显示于所述显示器的三维影像根据所述检测出的位置偏差而旋转或者平行移动的方式，对所述三维影像进行图像处理。 Position obtaining step of measuring the inner corner or a outer corner position relative to the viewer's display; standard position storage step, the decision for calibration position associated with the standard position acquired by the position measured in step the position of the inner or outer corner of the corner, acquires and stores the standard position to the storage unit, as the standard position; positional deviation detection step of detecting by the position obtaining step of viewing said new audiovisual content being measured in or those of the inner corner of the outer corner position relative to the display, the difference between the viewer and stored in the standard position of said standard position storage unit, a position error; and an image processing step , when the position deviation detected by the position deviation detection step, so that the three-dimensional image displayed on the display to rotate or move in parallel manner according to the detected positional deviation, the three-dimensional video image processing. 12.—种程序，用于调整在头戴式显示器中显示的三维影像的位置偏差，该程序使计算机执行权利要求11所述的位置偏差调整方法中所包含的步骤。 12.- program used to adjust the positional deviation of the three-dimensional image display in the head-mounted display, the program causing a computer to execute the steps in claim 11, wherein the position of the method contained in the offset adjustment.